Through this website you will get to know Vince Esterman’s ministry and the uniqueness of his approach. It will allow you to keep up to date with his travels and ministry commitments and partner with him as, together, we bring the Gospel message back to the very heart of church life to day. 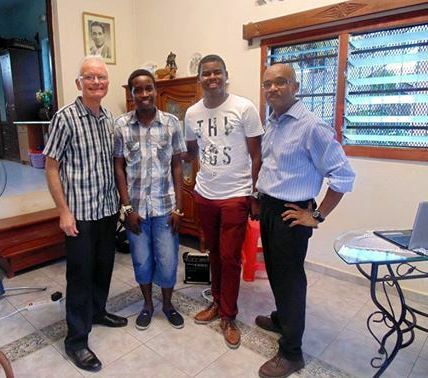 Reunion island - 'M PROUD OF THESE TWO GUYS - the dynamic duo of young pastors we've ordained recently. 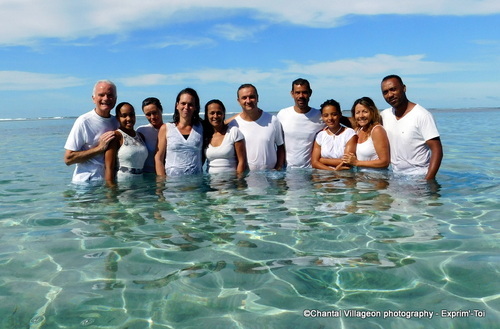 They conducted a baptism service in the sea and what a service! It was Acts 19 all over. The lady who just 4 weeks ago gave her life to the Lord with her husband, was hit by the power of God as she entered the water. 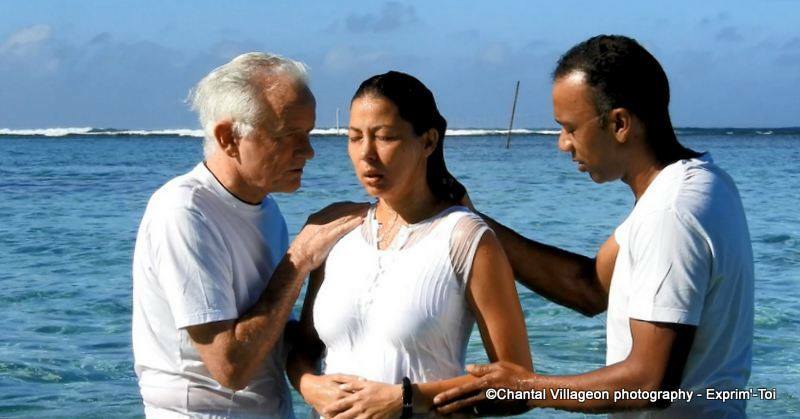 She had to be baptised quickly before she fell and came out of the water speaking powerfully in tongues to the amazemant of all on the beach. WELL DONE HOLY SPIRIT! WELL DONE FRED AND OLIVIER! ON THE 10th MARCH 1979 VINCE AND DENISE SAID "OK, LET'S DO IT" AND LET'S SEE WHERE LIFE AND GOD TAKE US. 40 years on this is what we look like...not too bad considering. Sunday in Church we invite our friends to celebrate with us 40 years of serving God together, feeling good about not wasting our lives. Reunion island - A PICTURE'S WORTH A 1,000 WORDS! Can you capture the spirit of what we experienced yesterday as we ordained two assistant pastors for our work in Reunion Island? We are raising up a new generation of Gospel preachers and what a team we now have ! 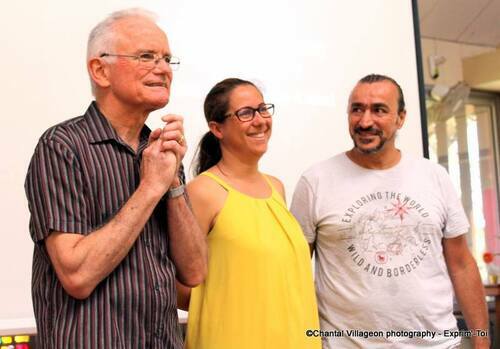 Yesterday it was Olivier & Rima, as well as Frédérique who joined our ministry team. When I asked the age of each member of the team we had 25, 26, 27, 28, 36, 40 43, 46 and the oldest at 51 (some I forgot to ask!). PIONEERING NEW WORKS SURE IS EXCITING! NOW FOLKS, THIS IS ONE FOR THE ANNALS. AN INCREDIBLE PHOTO! Today in church we celebrated our 6th anniversary since we started our first church meeting on the west coast of Reunion Island. These were the people who attended the very first meeting who are still with us. Let me mention 4 of them. 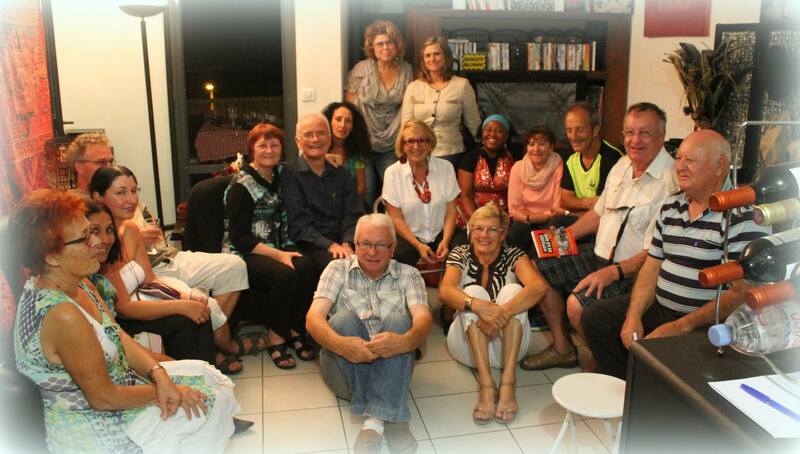 Firstly, there is Marianne, she's the grand-mother on the far left just behind me. It all began with her! She received a brochure we put in her letter box and rang me. She had been setfree from fear, totally free, in a meeting I had conducted 20 years previously She wanted to see me again so we conducted our first meeting in her daughter's home, second from the left (Patricia). 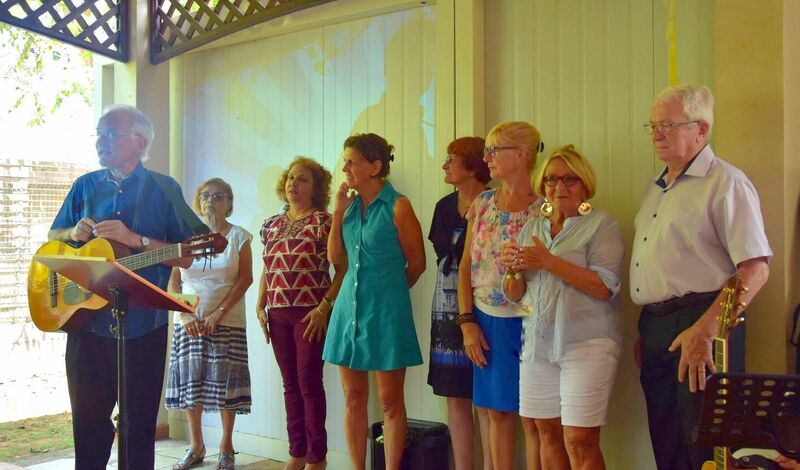 Patricia invited Pierre and Monique (1st & 3rd from the right) to come to that first meeting. They were VERY reluctant because it happened to be the night of their 46th wedding anniversary and they had seen so many pastors come and go,they supposed it was just another one. 6 years later we are all together serving God and seeing so many lives changed. THIS IS ONE AMAZING ADVENTURE WE ARE ON! 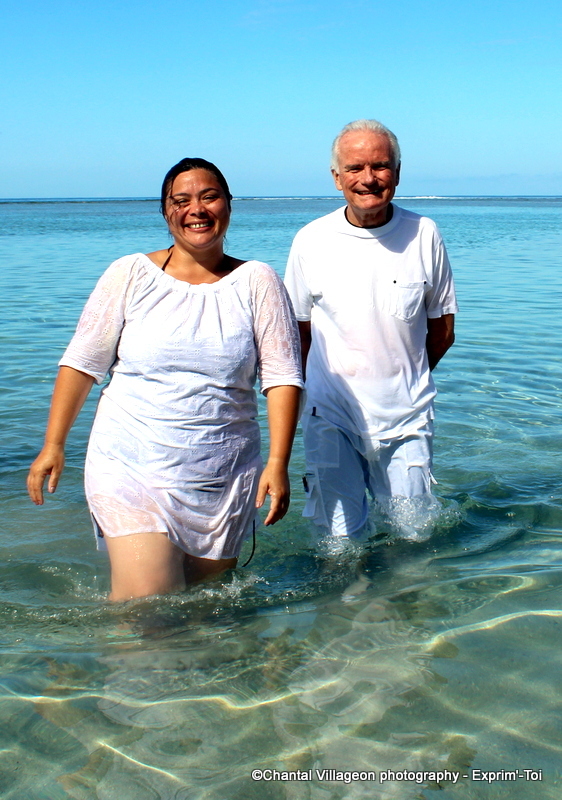 TODAY WE BAPTISED IN THE SEA TWO GREAT LADIES SAVED IN OUR CHURCH. Photo on the left is ANNIE. We did a letterbox drop around the church hall we use offering to pray for people if they send us their prayer requests. Annie contacted us saying she received a letter from God in her mailbox. 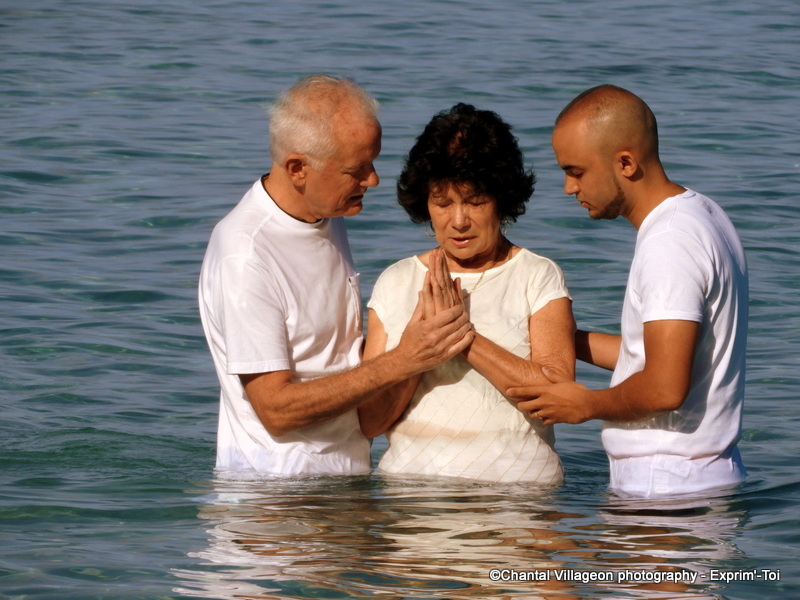 She came to a meeting, gave her life to Christ and joined the church. She worked for 10 years as a hostess in a Casino in the tourist sector. You can place your bets, she's made the right choice! On the right is CHRISTELLE. She is a Primary school principal. She was won to Jesus by one of her teachers who attends our church. She went through a terrible experience of losing a still-born baby in the womb. 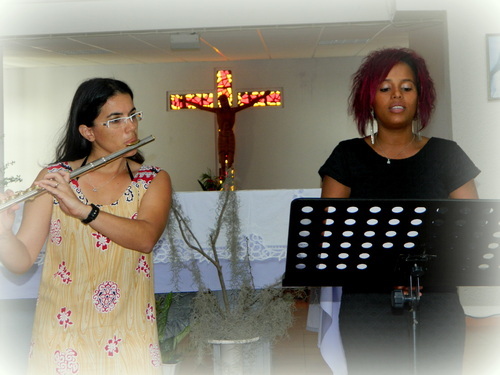 Her teacher reached out to her and helped her turn to God through this dramatic time in her life. 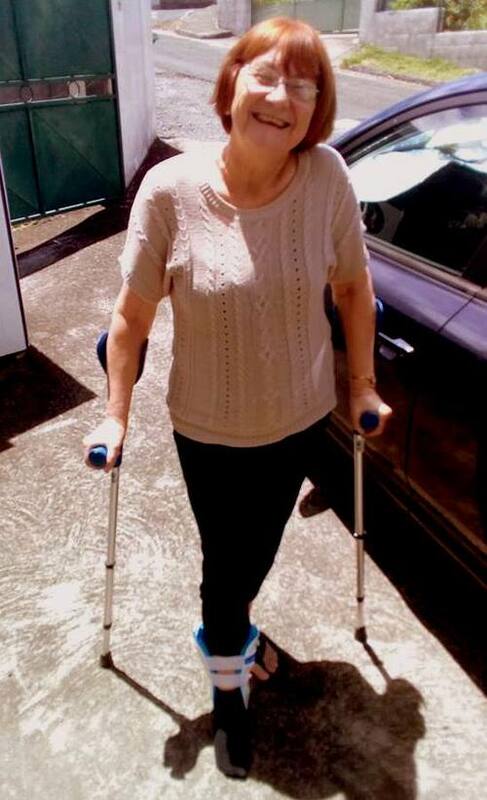 Today she is a radiant person and her husband can hardly believe what's happened to her. THERE IS NOTHING BETTER THAN HAVING FRONT ROW SEATS OF GOD AT WORK! 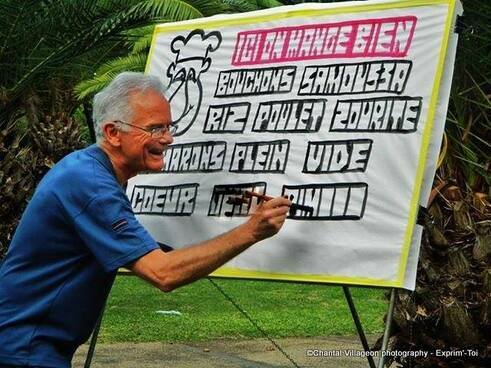 REUNION ISLAND - WE ARE FACING INSURRECTION ON REUNION ISLAND! 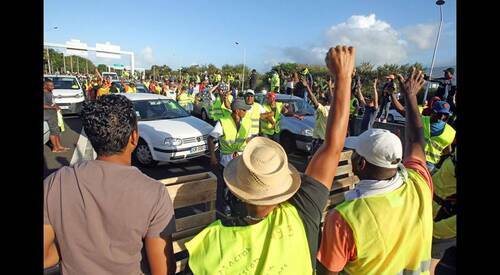 For the last 11 days the people of Reunion have risen up against the French government for the many taxes imposed since Emannuel Macron became president of France, over 300 in all. 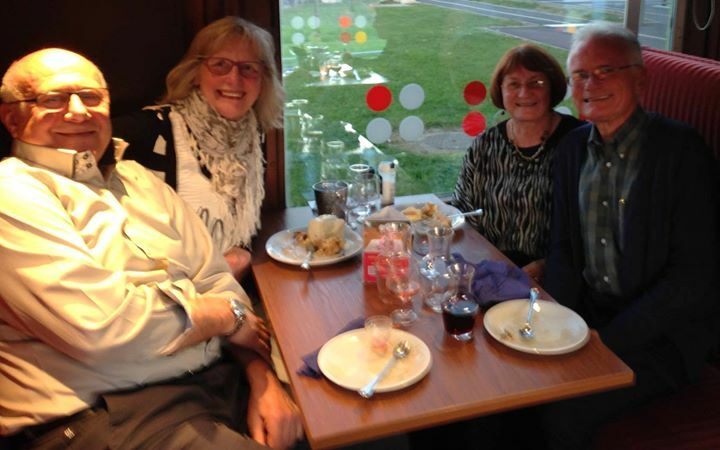 Denise and I have seen our small pensions reduced by 30%. The Reunion islanders have had enough. A populist movement, that embraces all levels of society, sprung up overnight, all wearing the yellow vest compulsory for every vehicule on the road in case of a breakdown. Last week there were riots and looting. Destruction everywhere. Road blocks appear every day in all the stategic roundabouts of the island. YOU DON'T WANT TO HAVE TO CATCH A PLANE OUT OF HERE AT THE MOMENT! Tomorrow the ovrseas territories minister arrives from Paris to try to put out the fires, armed with a water pistol. The French government isn't backing down. The yellow vests are planning 300 roadblocks to meet the minister. Schools have been closed for 11 days. Shops are closed, shopping centres are blocked and food in container ships is not being released. In 3 days there will be nothing left on the shelves. Offices and services everywhere have ground to a halt. And it's dangerous to go out at night. SO DENISE AND I ARE HUNCKERED DOWN AT HOME. Midweek church services are all cancelled and for Sunday services we have to leave very early to get through before the blockades are set up. Yet, despite all of this, 5 people came to Christ in our service last Sunday! LIFE CAN GET VERY INTERESTING AT TIMES! 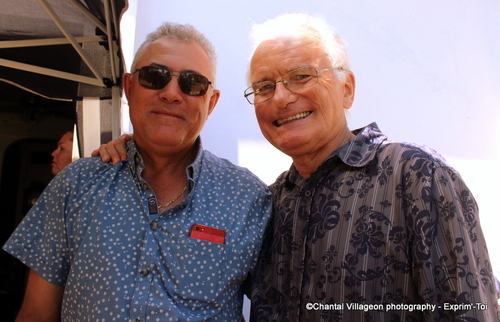 Reunion island - TWO WEEKS AGO WE DIDN'T KNOW THESE TWO ! Patrick's is an amazing story. Annie's story is quite miraculous. The morning of the service last week I was in prayer and the Lord spoke to me about a man who would come to the service for the first time. He would be alone and this was the word I needed to share with him. When we arrived at the Catholic chapel where we conduct our service we found this man, PATRICK, praying in front of the statue of the Virgin Mary. When we started our worship rehearsal he sat down and listened. He stayed for the whole service and at the altar call he responded and gave his life to Christ. During my message I spoke about firefighters. When I asked him publicly what was his profession, you guessed it, a firefighter ! He came to the midweek Bible study transformed and was back in church again this morning with overflowing joy. and has asked me to baptise him. Now for ANNIE, she hasn't yet given her life to Christ. But she is now a regular in our church ! She came 2 weeks ago because she is an artist and has been painting landscapes based on photos put up on Facebook by our secretary, Chantal. She came to church wanting to meet Chantal. Well, God has blown her away ! She ends up overwhelmed by each meeting. Having known a new age influence, she wants to understand God's word to build a new foundation for her life. She can't wait for our next meeting. BEING A PASTOR HAS VERY REWARDING MOMENTS! THIS IS SUCH A GREAT STORY! I would like you to meet FARID and LAURENCE. Farid is from Marseille, France, with an arab muslim background and Laurence, a Reunion Island girl. He's 54 and she's 38. They were both saved in our church. He was a drunk with nothing to live for. 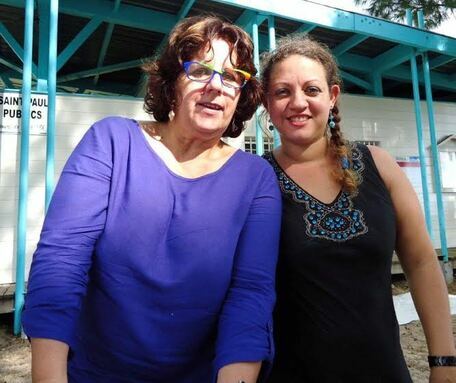 She is a teacher, now principal of an early childhood learning centre. Laurence came to Christ by coming to church. Week after week she heard the word of God and it affected her deeply. Farid came one Sunday and prayed out loud during communion even before giving his life to Christ. She was in recovery mode after a failed marriage. He was just a mess. But as the months passed he gave up the drink totally, stopped smoking and to be able to fit into a wedding suit, he lost 14 kilograms. That's right, a wedding!! I conducted their wedding just last week. It was a beautiful day. They are great helpers by our side as we serve the Lord .IT DOESN'T GET ANY BETTER THAN THIS! Reunion island - THIS IS A MOST MEMORABLE PHOTO! I was about to preach a keynote address to our movement of churches in Lille, France, last Saturday, 6/10/18. 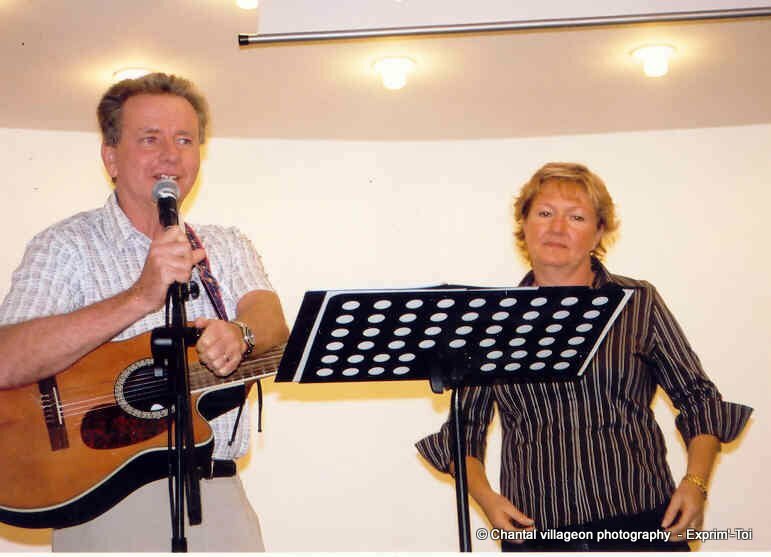 Leading the worship were Chris and Laura Christiansen, better known as the worship group EXO. 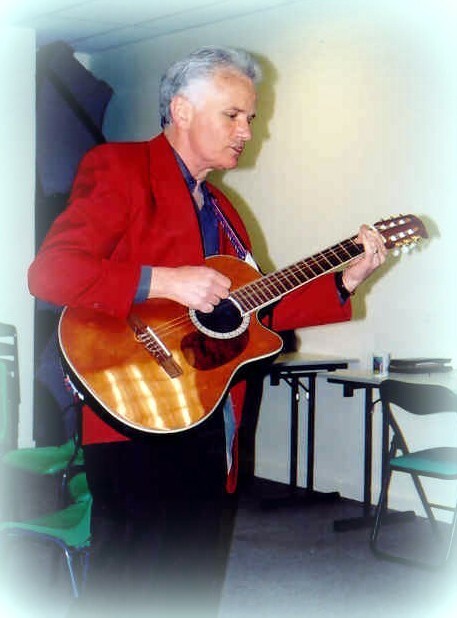 I have been planting churches throughout France for more than 30 years using their worship songs. They have made an incredible impact with their songs. Everywhere you go, people worship God with EXO songs. It was my opportunity to thank them publicly on behalf of the many thousands who have met God through their music. I must admit that as I heard them sing tears flowed. Reunion island - THIS GUY'S STORY, WELL, IT JUST HAS TO BE TOLD ! It all started back in 2013. It was Sunday morning and I was praying for the service before we set out. And suddenly a very clear thought came into my mind "Today, a man will come on his own to the service for the first time. No one knows him and he knows no one. And this is what you need to say to him…" It was so clear but so improbable because at the time our congregation was no more than 15 of a Sunday morning. The meeting began and as the first song rang around our rented hall the sound of a motor bike, a powerful one, could be heard. And in walks DAVID. He was alone and in the service for the first time. We did not know him. At the end of the message I shared with him publicly the word God had given me for him. 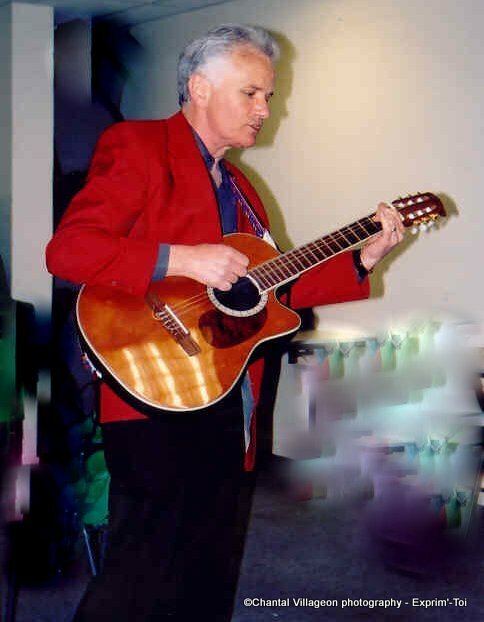 I found out later that he was actually well known in Christian circles because his father had been a Church leader and David was a specialist sound man that did the sound for many Christian events. However, he was himself totally closed. He rejected what he saw among the Christians and had refused to be baptised or join any church. In his own words, he was cold, intellectual and cynical. When I gave him the word which brought him back to when he was a child, he rejected it thinking "He says that to everyone. It's a stitch up." But when he got home the full impact of the word hit him. The following Sunday he was back with his wife and she was deeply moved in the service. We could see David changing on a daily basis. He was warmer, softer, teachable. Some weeks later I was astounded when he asked me to baptise him. 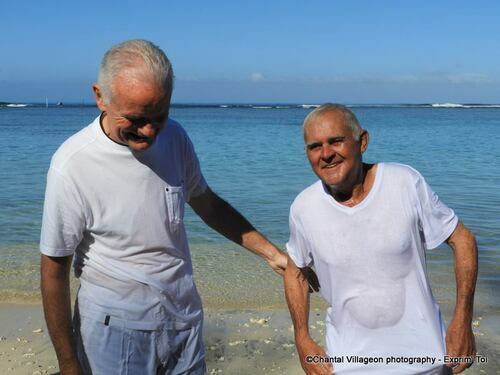 He had been resisting calls for baptism for 27 years ! 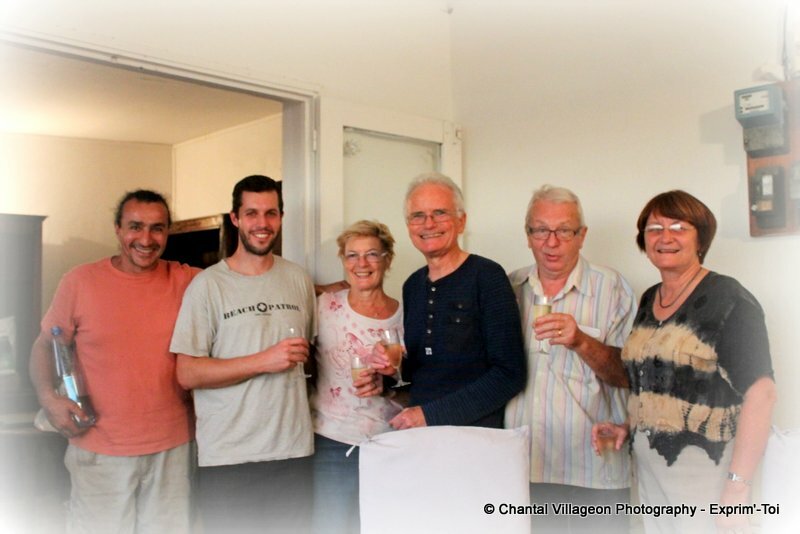 Several months went by and for the sake of his work he moved the family to France to settle. Over 4 years went by and last Sunday he was back in our service having returned to Reunion Island permanently during the week. The congregation was moved when at communion time he told his story. 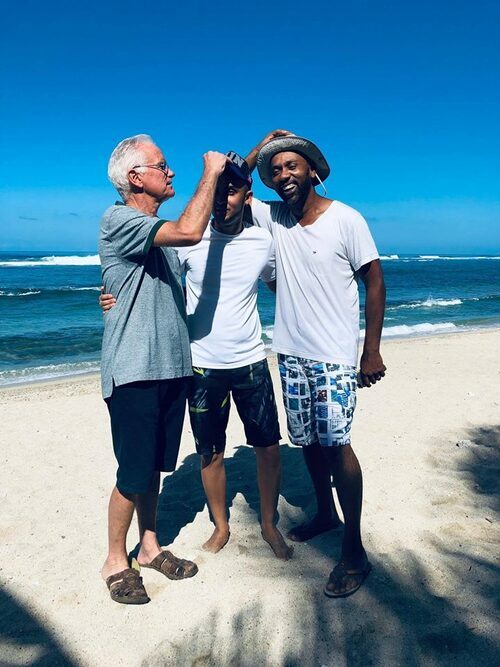 David is one of our very first converts to Christ in Reunion and WHAT A BEAUTY! 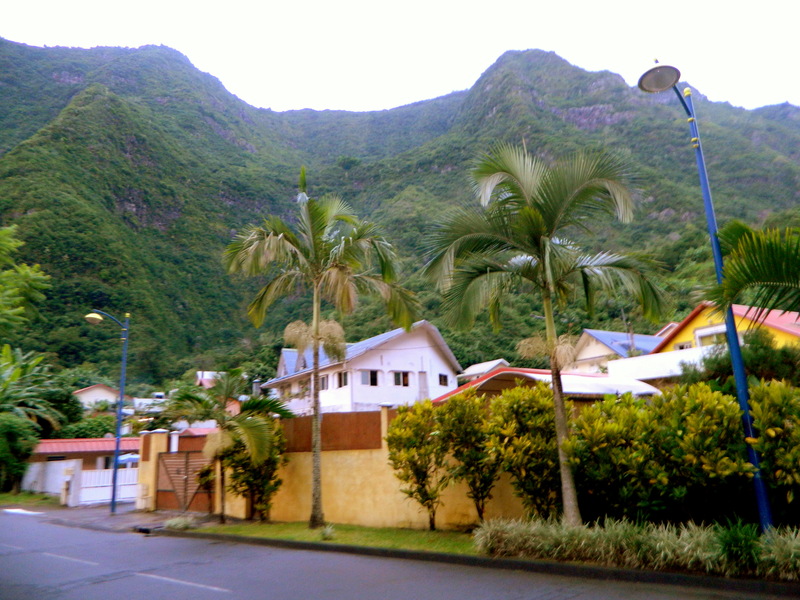 Reunion island - YOU'LL HARDLY BELIEVE WHAT YOU SEE IN THIS PHOTO. 9 months ago not one of these people (apart from me!) were Christians; It began with Yasmine (in blue). Her friend, Kelly, (to her right) came anxiously to see what her friend was involved in. First night she gave her life to Christ in tears. We baptised her in January in one of the most powerful services I've ever experienced.Then her testimony impacted her mother, her sister, her brother , her neice and two family friends. ALL WERE SAVED OVER THE FOLLOWING WEEKS. But this morning, her father (3rd from right), a hard aggressive man with a huge drinking problem who had caused much pain to his family, came to church and gave his life to Christ calling on God to forgive him for the man he had been. TEARS FLOWED FREELY THIS MORNING. CHURCH IS AN EXCITING PLACE! REUNION iSLAND - I'D LIKE YOU TO MEET DANY (top photo). TWO MONTHS AGO HE DIDN'T SERIOUSLY BELIEVE IN GOD! This Sunday I will be baptising him. His conversion testimony is absolutely stunning. Giving his life to Christ, in an instant he was delivered of persisting negative thoughts and received the ability to forgive his father for all the abuse he received. HE NOW DEVOURS THE WORD OF GOD AND WOULD LIKE TO BE A PREACHER OF THE GOSPEL MESSAGE. How good is that!! THIS WAS A SPECIAL MOMENT! 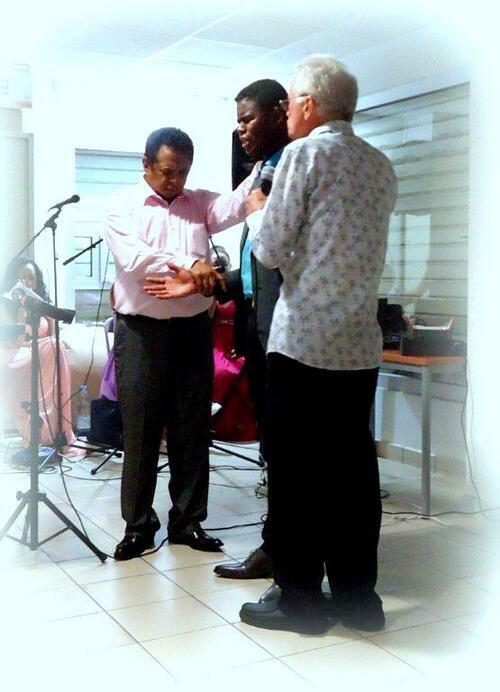 BAKO IS THE 5TH PASTOR WE HAVE ORDAINED ON REUNION ISLAND. But she, not he, is the pastor. She's in green next to Denise, assistant to our Madagascan pastor Rodolphe (far right). She is such a faithful and devoted leader and eveyone loves her preaching! COME ON GIRLS, RISE UP AND PREACH THE WORD OF GOD! 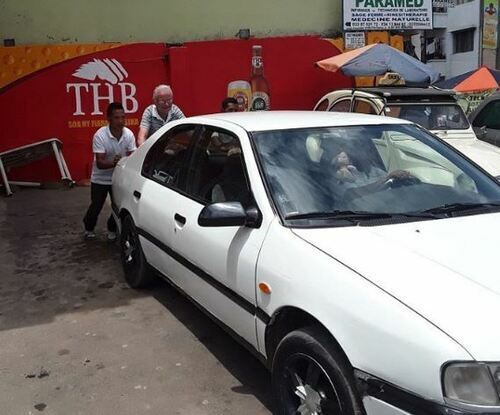 Reunion island - SUNDAY I PREACHED ON AARON HOLDING UP MOSES ARMS Here's the photo of me, guest speaker at a pastor's conference in Madagascar November 2017, pushing the broken down pastor's car along with a restaurant waiter. SO IF YOU HAVE GOOD LEGS, FORGET YOUR TITLE AND JUST PUSH! 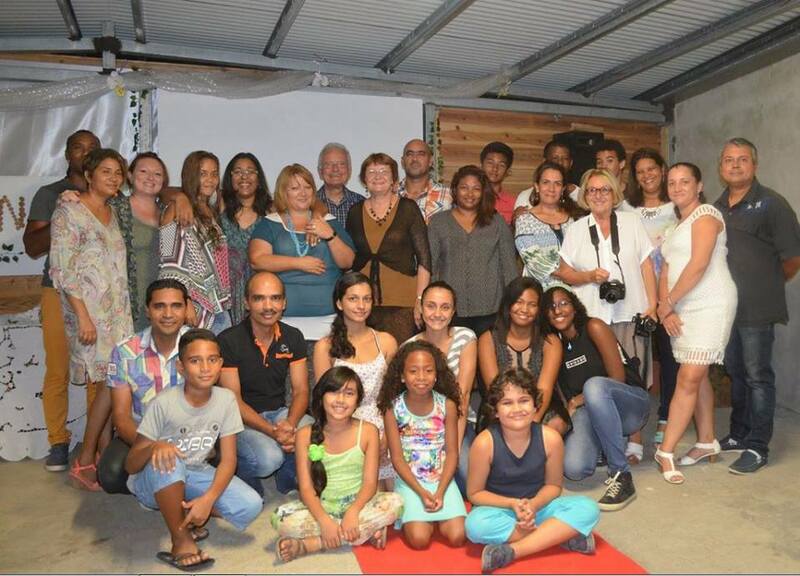 Reunion Island - THE CITY OF IPSWICH HONOURS VINCE & DENISE! That's right. 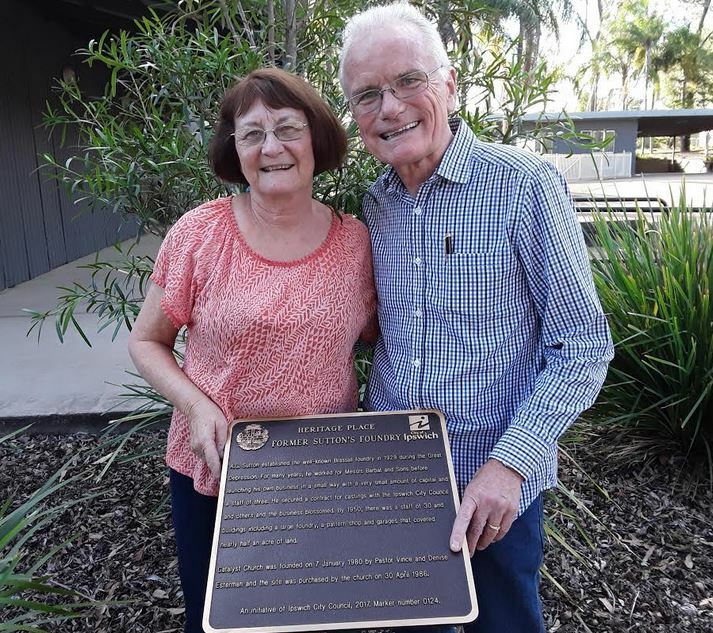 They have placed an official bronze plaque with a heritage number onsite at Catalyst church. It refers to the Suttons Foundry which has been a part of Ipswich's history. On the plaque is mention that we bought the foundry and estbablished the church on January 7 1980. It's no big deal really but it's a trace of the work we've done over many years. WE ARE VERY GRATEFUL TO GOD FOR HIS ABIDING GOODNESS TOWARDS US. Last night at the opening night of the A2A2018 National conference. THIS IS FRONT PAGE NEWS! Thérèse pressed us to baptised her. She could not wait! It all started with her daughter who came to a Bible study to make sure that her best friend had not fallen into a cult. That night Kelly gave her life to Christ. When she was baptised in January it was one of the most powerful baptisms I've ever experienced in 40 years of Ministry! Since that momentous day 5 people of her family have given their lives to Christ including Therese, her mother, who we baptised today. It was such a powerful time. In the service that followed 3 people gave their lives to Christ including 2 men one of whom is Therese's eldest son and another man a close personal friend. WE ARE WINNING REUNION ISLAND ONE PERSON AT A TIME! WELL FRIENDS, IN THE 60'S THE BEATLES SANG "Will you still need me, will you still feed me, when I'm 64" The good news for me is YES! Tomorrow Monday 9th of April I turn 64. And I'm happy to report that Denise still needs me and she still feeds me. Life is good! THIS MORNING IN CHURCH WE HAD A REAL GOSPEL CHOIR! 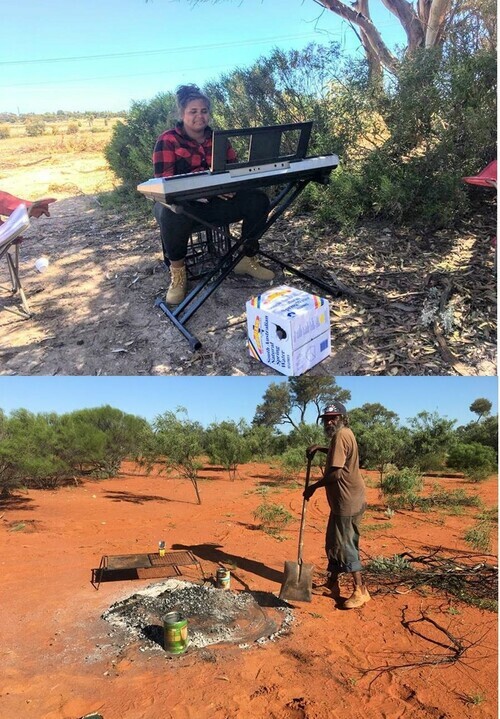 They didn't need a sound system. Neighbours came when they heard their singing. 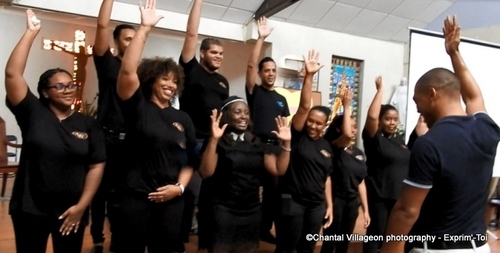 These are a Reunion Island based choir and we connected well with them. At the end of the service a 15 year old gave his life to Christ. THESE ARE EXCITING DAYS IN CHURCH! I'VE GOT TO TELL YOU ABOUT THIS GUY! His name is Joel and he is 62 years old.. When he first came to our Bible studies he was so "blank". He didn't understand a thing. After that first night I thought " we'll never see this guy again". But the next week he was back. Second night he looked just as totally blank. This continued for 3 months! He was very timid and never said a word. Then one night, before I began the study, he spoke up "Could I say something?" "I've been observing you for these 3 months. How can I have the faith that you have?!" WE WERE FLOORED! That night we led him to Jesus. 18 months have passed and Joel asked to be baptised. It was a wonderful moment. As he came out of the water he said, he felt God gave him wings to fly like an eagle! FLY, JOEL, FLY!! FOR THOSE WHO DON'T READ FRENCH...but you've worked it out. 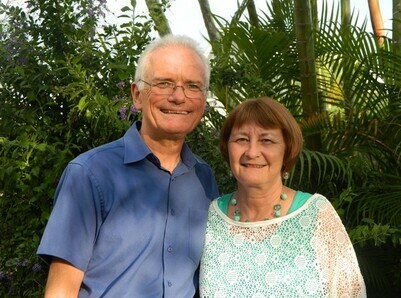 Tomorrow Denise and I celebrate 39 years since Pastor Trevor Chandler led us in vows that were a life-long commitment. Young people have trouble getting their heads around those kind of numbers. When Denise worked at EDGE Kids Life in Adelaide and she celebrated 32 years married the young people working with her were astounded. 32 years! With the same man?!!! They thought it was cumulative- 8 with the first guy, 12 with another, 5 with the 3rd and the rest with the old bloke. Well NO, the 1st, 2nd, 3rd and 4th are all rolled into one. IT'S ME! THANK YOU, JESUS, THANK YOU, DENISE! HAVE YOU SEEN THIS MAP OF REUNION ISLAND? Take a look at the towns at the end of each line. We now have churches in these 4 towns. A 82 year old man in the church drew a line through the 4 towns and found a cross. IS THIS SIGNIFICANT OR AM I SEEING THINGS?! Reunion Island - HAVEN'T BEEN BACK TO AUSTRALIA IN NEARLY 6 YEARS! But Denise and I are heading home for a visit in April/May. We'll be visiting Ipswich, Gold Coast, Sydney, Adelaide and Bundaberg, all in just 4 weeks. 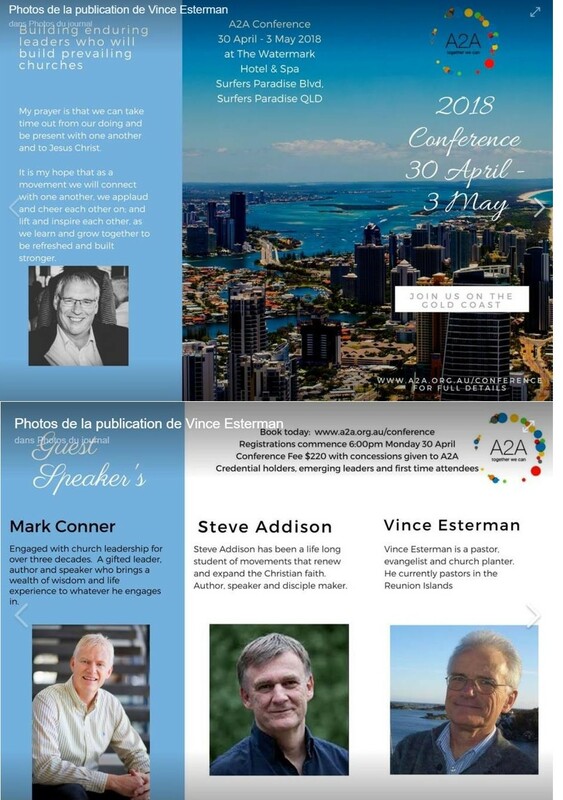 Looking forward to catching up with old friends and making new ones at the A2A conference. SEE YOU SOON! 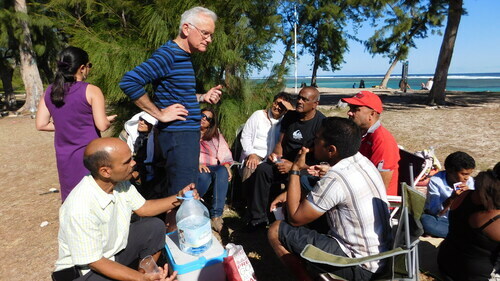 Reunion island - How this simple Gospel preacher was used by God is just phenomenal! Yet the message is there for all of us to preach to a dying world. There is salvation in Jesus Christ! A WEEK HAS PASSED SINCE BILLY GRAHAM WENT TO HEAVEN. I think I can recognise some faces in the cartoon below. I'm counting on a few myself when it's my turn. Une semaine s'est écoulée depuis que Billy Graham est allé au paradis. Je pense que je peux reconnaître quelques visages dans le dessin animé ci-dessous. Je compte sur quelques-uns moi-même quand c'est mon tour. 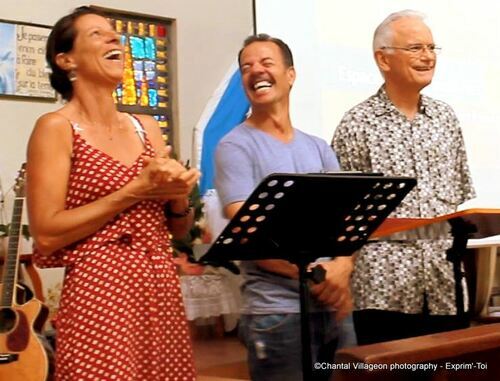 Reunion Island- TODAY WE ORDAINED TO THE MINISTRY Fred and Gaëlle. They have been part of our work for over 2 years and have a remakable heart for people. They will be leading our new church in the south of the island. GOD IS DOING AN AMAZING THING AMONG US! YOU ARE WITNESSING THE BIRTH OF A NEW CHURCH! For the last 6 months we have been working with these people preparing for the launch of the new Church in the south of Reunion Island. THEY ARE NOW READY TO GO! We will be ordaining Fred (standing next to me, wife Gaëlle on the extreme left) to the Ministry as pastor on February 11th. 2018 is going to be a BIG ONE! THIS LOOKS LIKE AN ORDINARY BAPTISM. IT WASN'T! This young woman gave her life to Jesus in October 2017. She came to her first meeting because she wanted to see if her best friend had not fallen into a cult. On that same night she gave her life to Jesus in tears. She's an accountant, and pretty reserved. She has no Christian background and no real understanding of the Word of God. When we baptised her TODAY she had an Acts 19 experience. 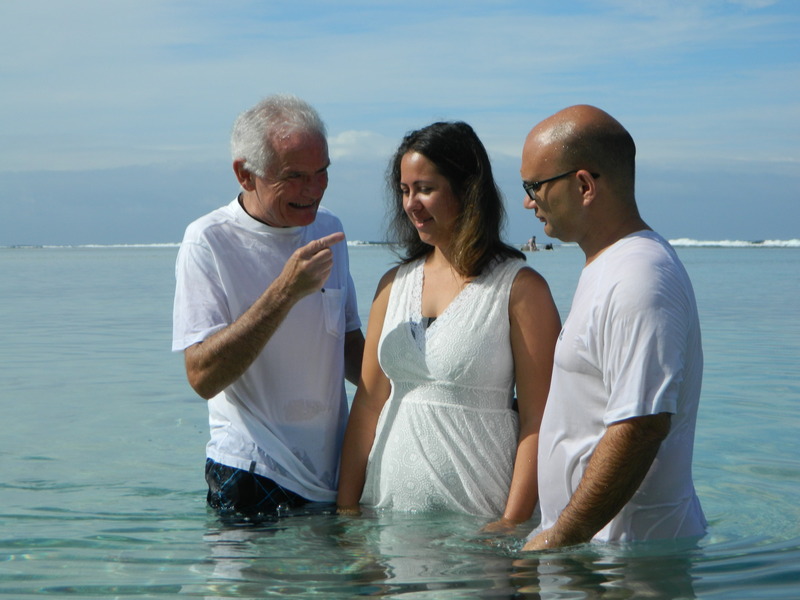 The power of God came upon her even before we baptised her. When she came out of the water she let out a mighty scream as the Holy Spirit delivered her and filled her and she broke out in a powerful flow of speaking in tongues while at the same time sobbing her heart out. People on the beach watching on were all in tears as God moved. I HAVEN'T SEEN ONE OF THESE BAPTISMS SINCE THE 1980'S. As I spoke with people on the beach they were in a state of shock. They had never seen anything like this. THE WORSHIP SERVICE THAT FOLLOWED WAS HEAVENLY!!! 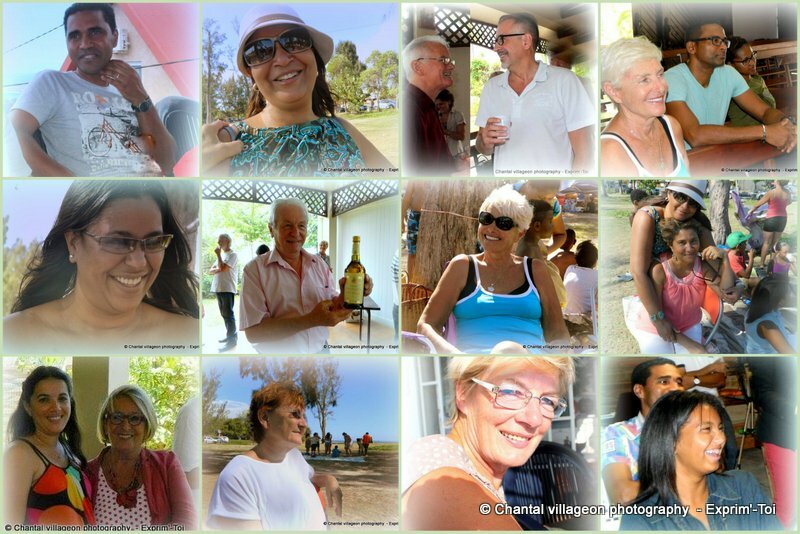 REUNION ISLAND - FABULOUS! I conducted a wedding on Friday. The lady had been following us on Facebook and one Sunday morning she just turned up to Church. In the same morning she gave her life to Jésus, asked to be baptised and asked me to do her wedding. Her husband is a recently retired police chief on the island. He has such a great heart and was very moved by the ceremony. I have never been accosted by wedding guests wanting to speak with me as I was yesterday. One couple asked me to do their wedding. Another young man asked me to lead him to the Lor d. THERE'S NOTHING BETTER THAN AN EXCITING CHRISTIAN LIFE! 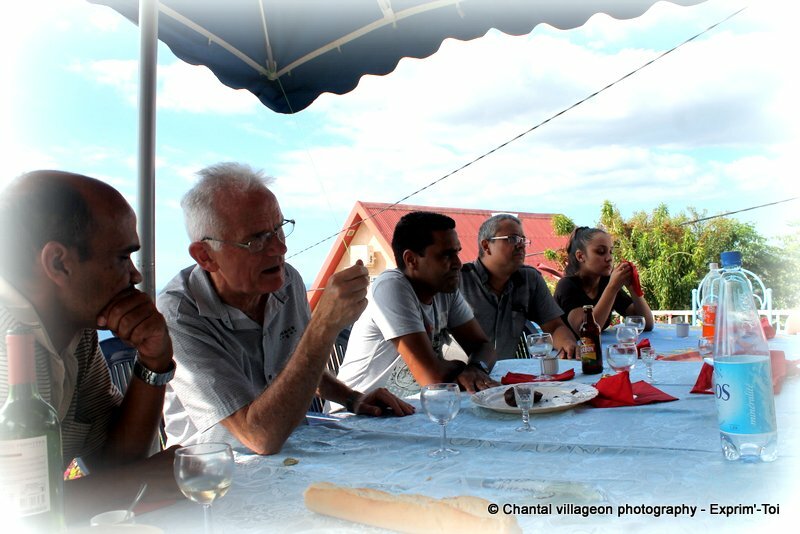 Reunion island - HAVE A LOOK AT THIS! 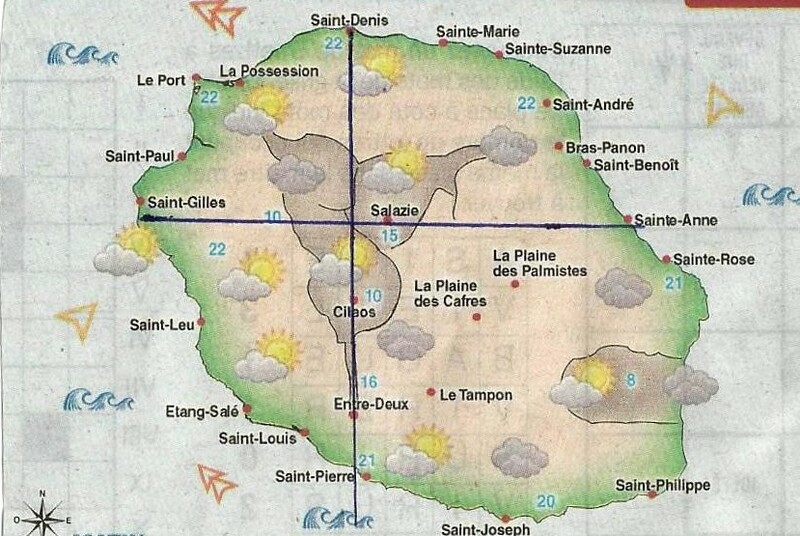 On Sunday the oldest man in our church, Marcel-René 82 years young, showed me this map of Reunion Island. He drew a direct line from our church in the north to our church in the south, and another line from our church in the west to our church in the east and this is what he came up with. It's a perfect cross. THIS HAS ALL HAPPENED IN THE LAST TWO YEARS! Everyone who has seen this is excited about how many other lines we can add to the picture. BELIEVE ME, SOMETHING IS HAPPENING ON REUNION ISLAND! 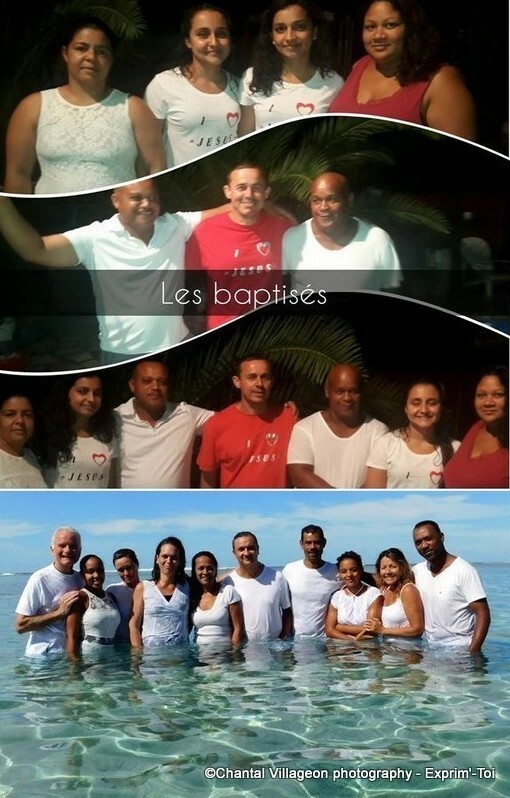 THIS WEEK WE BAPTIZED 15 PEOPLE ON REUNION ISLAND - all new Christians who have recently given their lives to Christ. Such joy! God is moving in the islands of the sea! TODAY WE BAPTISED 8 PEOPLE WHO HAVE JUST RECENTLY GIVEN THEIR LIVES TO CHRIST. 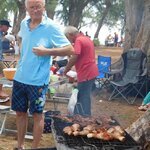 In was in the beautiful waters of l'Ermitage beach in the west of Reunion Island. Many people came to witness this momentous event. Even the local press turned up to report on it. In the service that followed we doubled the size of the congregation. People on the beach said they could feel the power of what was happening in the water. GOD WAS SURELY PRESENT WITH US TODAY! Some of the lovely people who have recently joined our church on Reunion Island. These photos were taken last Sunday. YOU CAN FEEL THE JOY AND THE LOVE. It's a wonderful way to do life! Reunion Island - IT'S BEEN A VERY SAD DAY. My dear friend and fellow preacher of the Gospel from Madagascar whom everyone knew as Pasteur Jules passed away early this morning, aged 66, after a stroke earlier in the week. 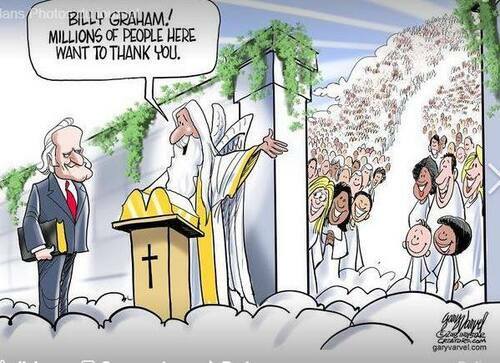 Jules was a remarkable man of God. As a youth he tended cattle but God raised him up to be a mighty apostle in his country. In the 1980's he brought revival to the land filling stadiums as he preached the Gospel of Jesus Christ. 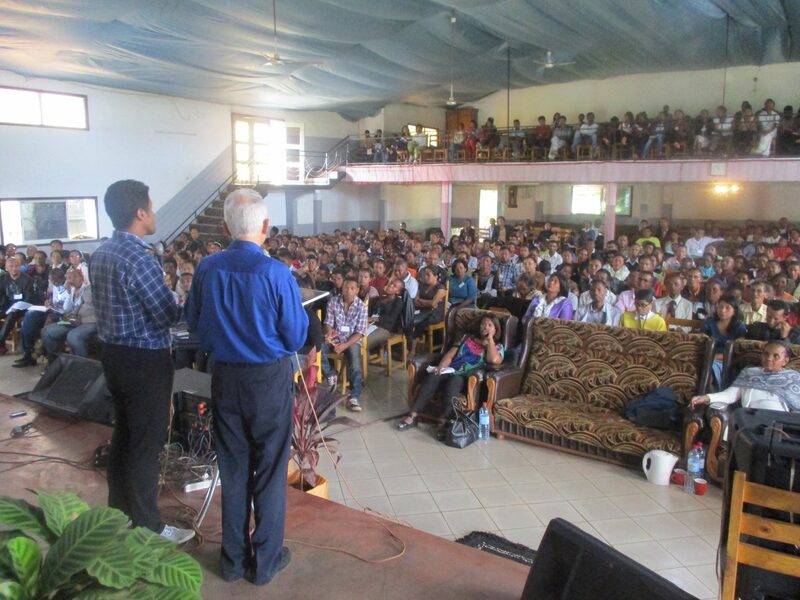 It is estimated today that there are 2 million Christians in churches in Madagascar (population 24m) as a direct result of his preaching. We toured together a number of times. 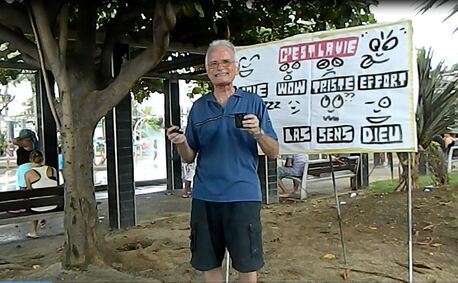 I taught the pastors in the morning and he would preach to the masses in the open air in the afternoons. He was a lovely man, kind and loving, full of faith. He was a giant in the Kingdom of God on earth. Tears welled up within as I lead in prayer for his family in our Saturday night service. He is enjoying his reward. We bear the pain of our loss. Till we meet again, Jules. ARE THE FACES of those we will be baptizing on November 5th. They have all recently given their lives to Christ. Others are showing interest as well. I'm expecting that there will be more. SOMETHING GOOD IS HAPPENING ON REUNION ISLAND.! Reunion island - 40 YEARS AGO A YOUNG BUSHY-HAIRED 23 YEAR OLD WAS LAUNCHED AS A MINISTER OF THE GOSPEL. And it's been quite a ride! In fact, looking back, I realise that all my life, that's all I've ever done - preach the Gospel and teach the Word of God. THIS SUNDAY WE WILL HAVE A SPECIAL THANKSGIVING SERVICE for those 40 years. If you have any old photos I'd love to receive them. Thank you all for being a part of my story. Reunion Island - WHAT A MOMENT THIS WAS! Saturday we ran what we called the AGAPE FESTIVAL. It was a combined event bringing together Catholics and Protestants on the island. First time this had ever been attempted. We had much opposition from hardliners but we pulled it off! I was one of the organisers and speakers. 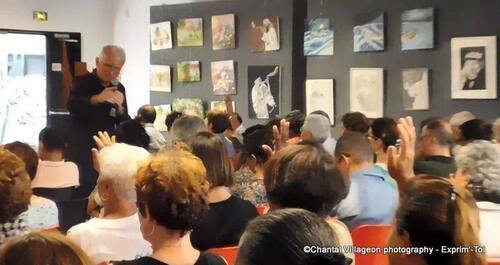 I spoke to an overflowing crowd, many of whom were Catholics. 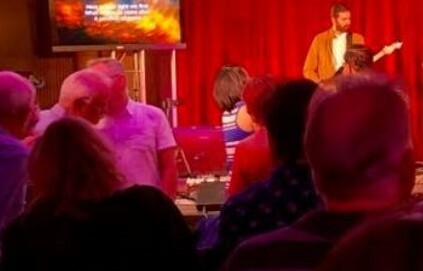 At the conclusion I invited people to commit themselves to following Jesus. Many hands went up. This is only part of the crowd. It was a deeply moving time. One of the highlights of the day. 2000 YEARS ON, THE GOSPEL HAS NOT LOST IT'S POWER TO CHANGE LIVES! 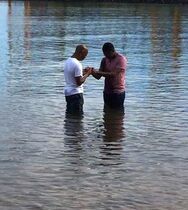 HIS GUY GAVE HIS LIFE TO CHRIST THIS MORNING!! The congregation was in tears. He was a bad muslim, messing with drugs and alcohol. He came once or twice some months ago but lasted about 5 minutes in the service before running out. Surprise, surprise, he came to church this morning. When I made the salvation call, two ladies responded but he didn't budge. Yet I felt to go after him. I said "Young man, if you want to come forward, then do it!" He sprang to his feet and ran to the front. 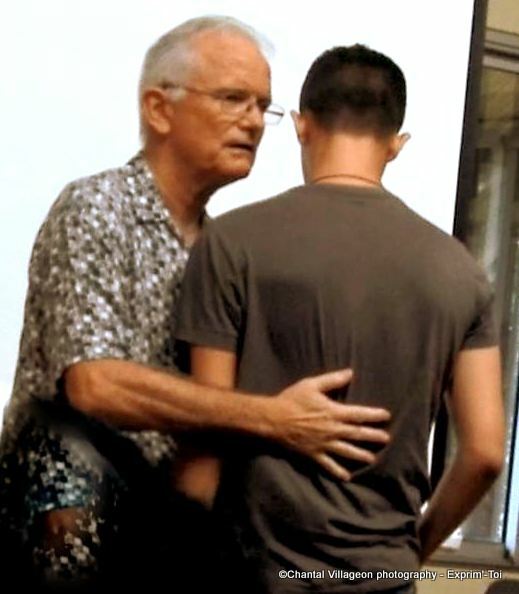 He was shaking like a leaf as I lead him in a prayer of commitment to Christ. He told me at the picnic that followed that, when I spoke to him directly, he immediately felt that it was Jesus Himself speaking to him. This is so often the case for muslims. They need to have a direct revelation of Jesus. IT WAS A SUBLIME HEAVENLY MOMENT. THOSE WHO WITNESSED IT WILL NEVER FORGET IT! Reunion island - Love, I mean LOVE this photo! This family came back to church this morning. 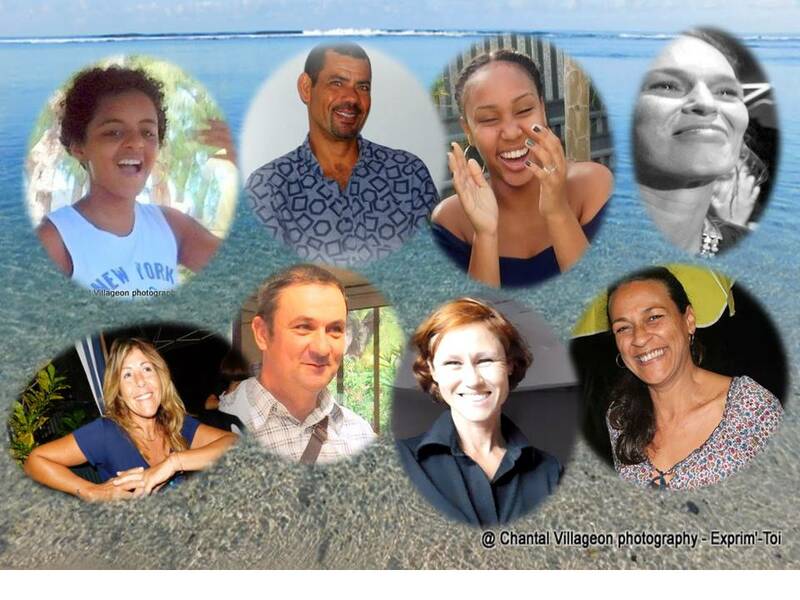 They are so much a part of our story on Reunion Island. They came to the very first services we held back in 2013. We loved them as our own children...Jimmy, Véronique and their 3 children Dylan, Ryan and Leika. Leika was just a bump in mummy's tummy at the time. We followed them over two years going to their home each Tuesday night along a very dangerous stretch of rosd. One night a rock from a water-logged cliff landed on our windscreen. They experienced major problems with the construction company they launched and dropped out of church for 18 months. BUT TODAY THEY CAME BACK TO THE FATHER'S HOUSE! Yes, our heavenly Father but also their spiritual earthly father. It was an amazingly emotional time! GOD IS ON THE MOVE bringing the hearts of the sons back to the fathers! BRINGS A LUMP TO MY THROAT! 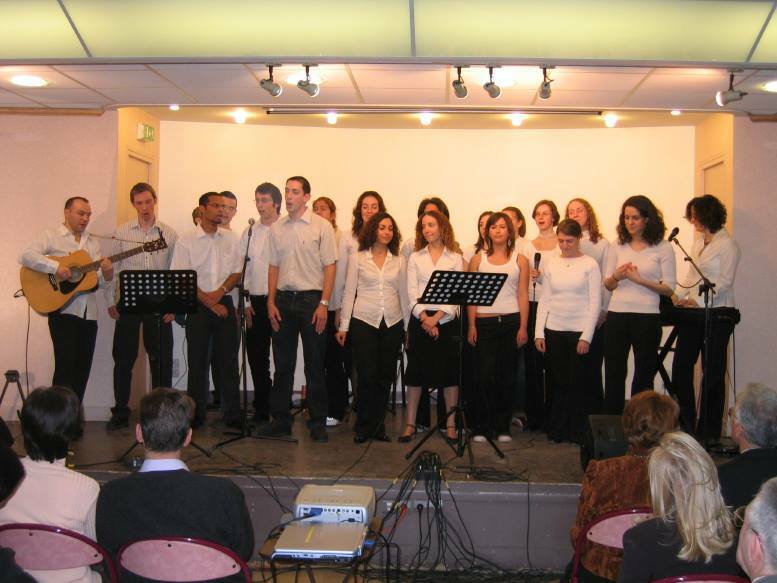 These were the young people of our church in Paris back in 2006 before we returned to Australia to set up our base and begin itinerant ministry. I loved these young people. I believe that they are going on for Jesus as young adults wherever they are today. Bottom right of the picture are Vince and Denise. ANOTHER SPECIAL MEMORY. Celebrating 40 years of ministry next month! 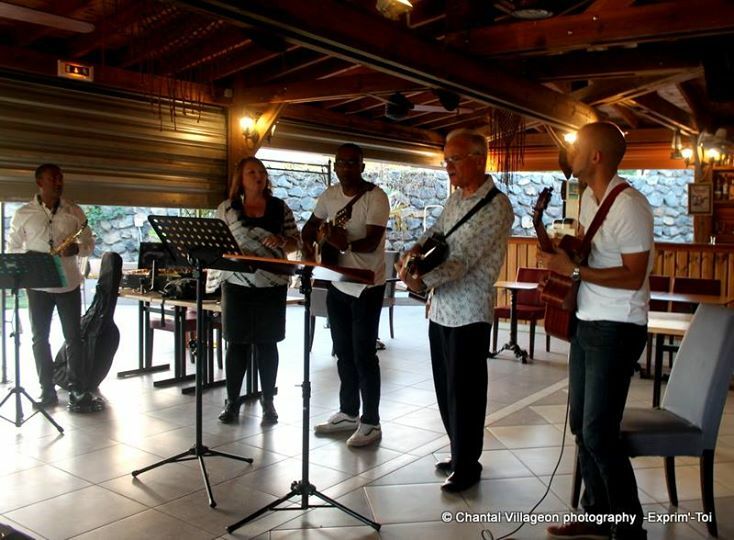 Reunion island - THIS PHOTO WILL TAKE A VERY SPECIAL PLACE IN OUR "ALBUM". 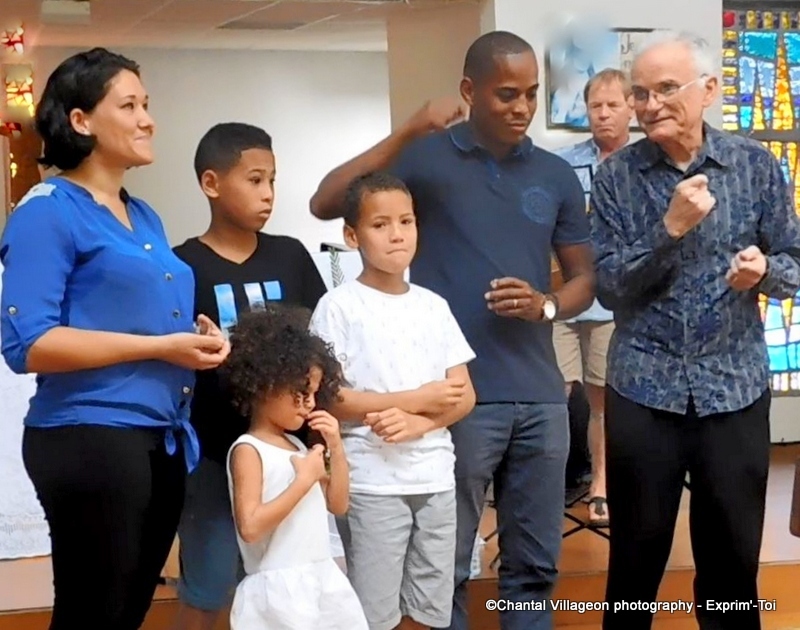 David and Béa, and their 2 children, were the very first to come to Christ in our very young church on Réunion Island 3 years ago. We walked with them over 18 months and loved them as our own children. But because David couldn't find work on the island they moved to France and we lost contact with them. It was a real heartache for Denise and me. 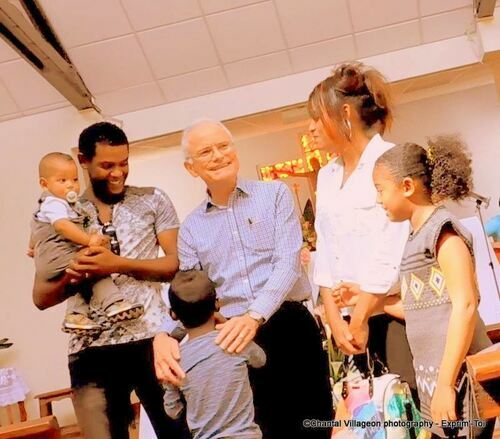 This morning without any prior notice during our worship service, David and Béa turned up now with 3 children! I was in a state of emotional shock! I asked them to come forward and I explained the significance of the moment to the congregation. David said to me that he needed to reconnect with his spiritual father. There were many tear-filled eyes in the congregation this morning. 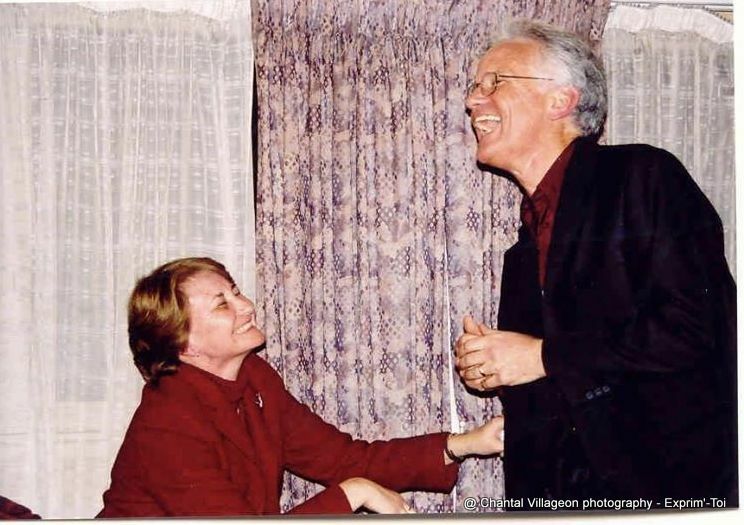 40 years as a minister of the Gospel is something worth celebrating ! Could you help us ? 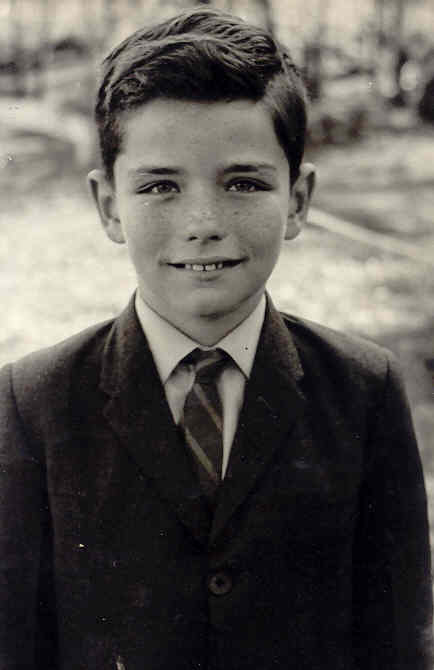 We would like to gather OLD PHOTOS of CLC Brisbane days, of CLC Ipswich and of the early years in France. We would also like to receive from you short anecdotale stories and short TESTIMONIES especially of those who have come to Christ with us over the years or have been released into the ministry with us. THANK YOU SO MUCH FOR YOUR HELP TO MARK THIS WONDERFUL OCCASION ! conducted my first baptism service in 1979. 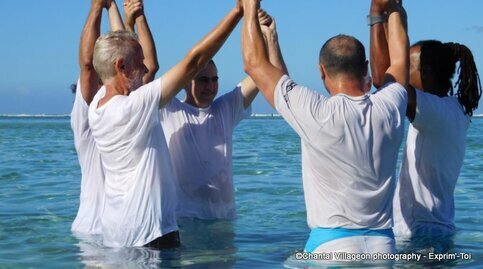 Since then I have baptised hundreds who have given their lives to Jesus. So who will be next??? (That's me in the centre of the photo. I was 25 years old. PARIS/REUNION ISLAND - LOVE THESE TWO PHOTOS! Bottom photo was my team in Paris back in 2004/5. 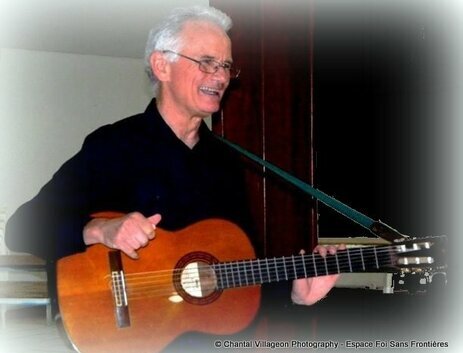 For two years we did concerts in restaurants and piano bars around Paris singing the songs from my album. It was a wonderful experience taking the Gospel to the people with outstanding musicians and singers...Luis, Sung-Eun, Christiane and Aure. TOP PHOTO WAS LAST SATURDAY NIGHT! That's right, we're still at it. This time with a new team doing the restaurant circuit in St Pierre, Reunion Island: Jimmy, Gaëlle, Fred, Olivier. Been doing this for 40 years now. I NEED THE BUZZ! 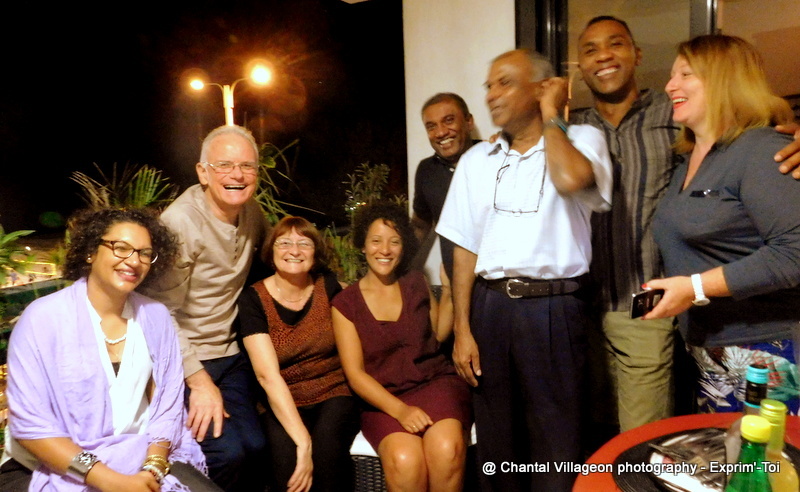 REUNION ISLAND - TAKE CAREFUL NOTE OF THESE FACES. These are the people (plus at least 5 missing from the photo) who will be the basis of our new church in the south of the island in the coming months. We meet together on Thursdays. It's a stirring time around the Word of God and then we hit the meal Chantal, our secretary who's unit we meet in, serves up - incredible dishes each week. NO WONDER WE'RE ALL SMILING! CHECK IT OUT ON A MAP OF THE WORLD. 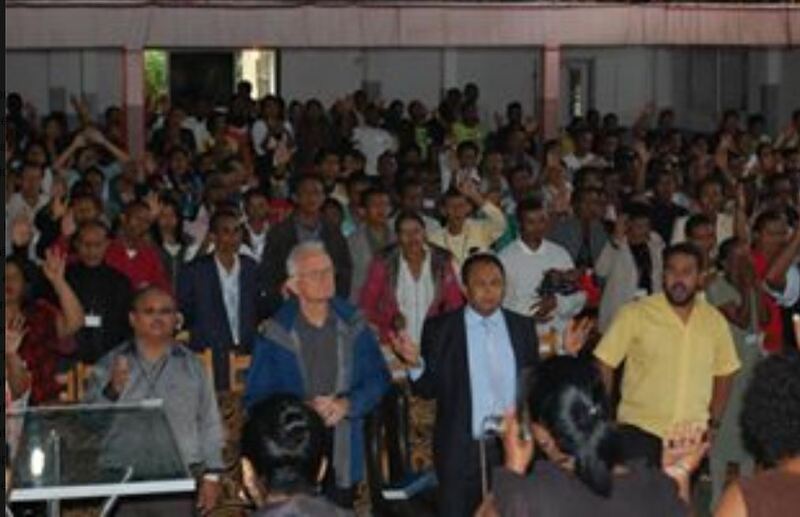 A network of ministries and churches is emerging in the southern Indian Ocean. 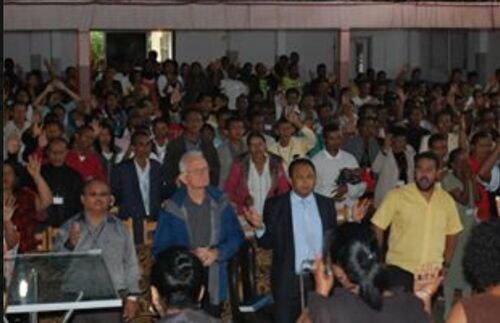 I just returned yesterday from 3 days of meetings with pastors in the capital of Madagascar, the city of Antananarivo. A number of influential pastors have asked to join us with the view of planting churches and raising up young ministers of the Gospel across the region. 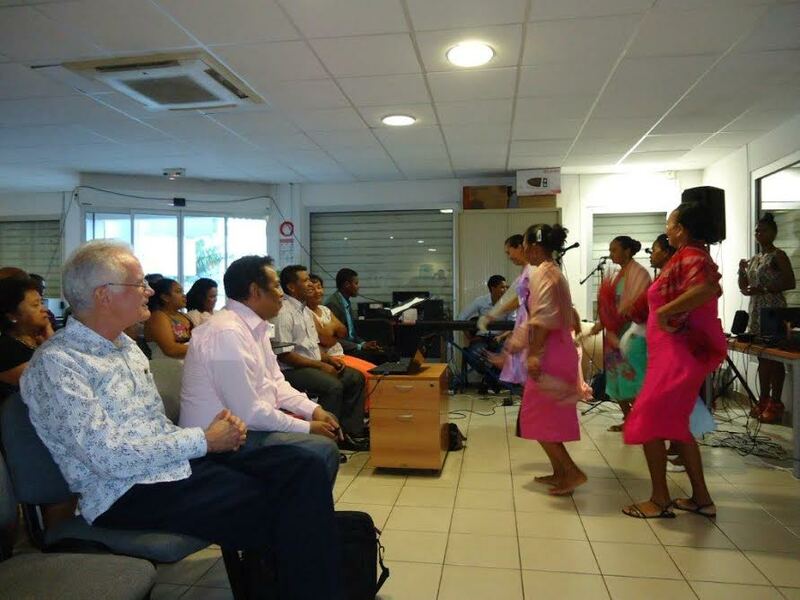 There is now an arc Mayotte-Madagascar-Reunion where we have churches working together in our new movement of churches. It does require a lot of travel to keep the training and the work moving ahead. A friend of our ministry in Adelaide has sent funds to cover all the travel expenses for those we send in the first year. Isn't that amazing! Why would you settle for a boring Christian life?! Can't do an anniversary without a cake! 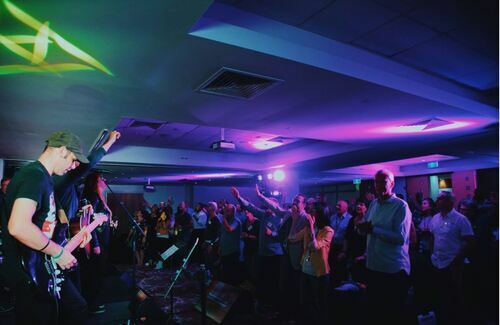 So here it is...last saturday 180 pastors and leaders helped us celebrate 30 years of partnership for the Gospel in style! Thank you Jésus! 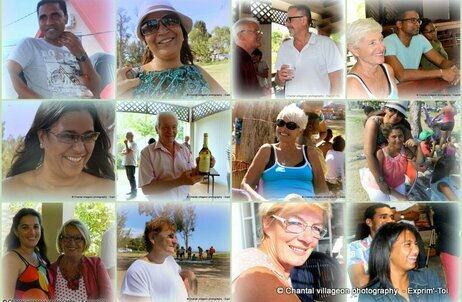 ON MONDAY WE CELEBRATED CHANTAL'S 70TH BIRTHDAY with a BIG picnic on a public hliday. Many of you know Chantal. 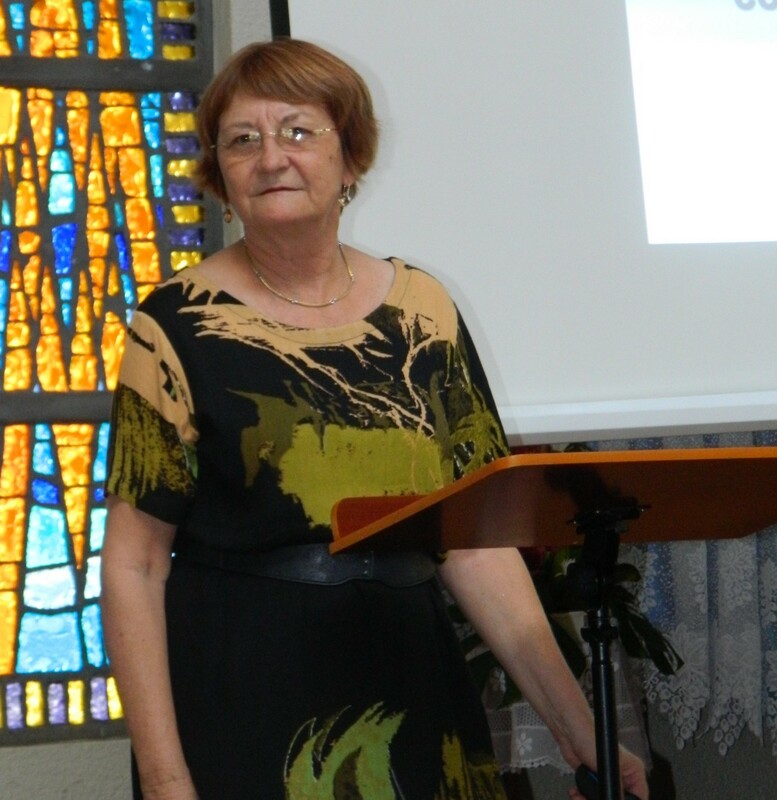 She came to Christ with us in Paris in 1999 and has worked closely with Denise and me ever since. She does all of our websites and Facebook walls. She is so dedicated to God, to us and to everyone who is part of her life. She's just unique, full of joy and fun, always wanting to please others. So happy, happy birthday, Chantal. More photos of the big day coming up. THIS IS JUST SOOO SIGNIFICANT! 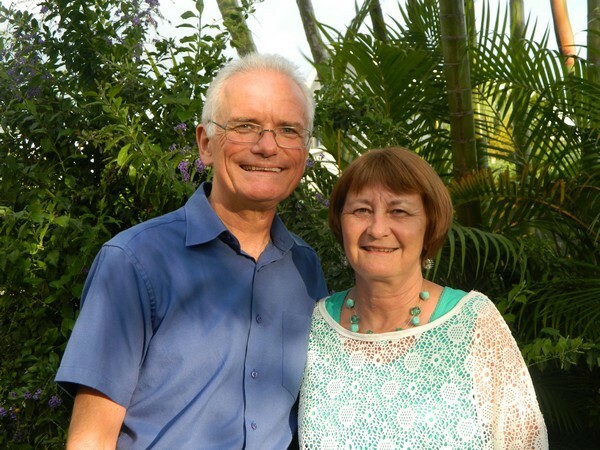 Vince and Denise ESTERMAN and Antoine and Christiane NOCEK are celebrating 30 years of friendship and partnership for the cause of the Gospel. 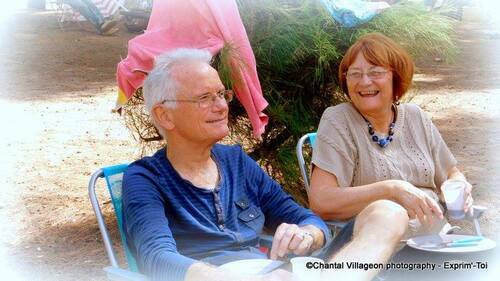 We met in 1987 in a meeting in the suburbs of Paris and have teamed together all these years. We have traveled together to France, Belgium, the Netherlands, Poland, Sweden, Denmark, England, Wales, Argentina, Australia. Two very different couples yet who see God's work in the same way. We have never experienced conflict! Together we have planted a movement in France that has raised up 30 or more churches. Today we continue this precious friendship and team ministry raising up new churches in Reunion Island, Madagascar, Mayotte and throughout France. 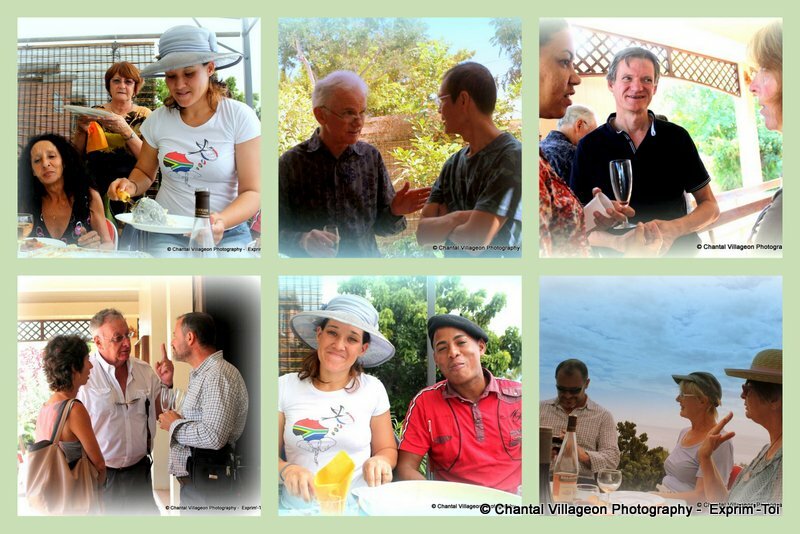 We took time out to share our joy and successes with those who work with us. We particularly want to thank our precious Lord Jesus Christ whom we love and serve. Yet we feel that the best is yet to come...call us crazy! 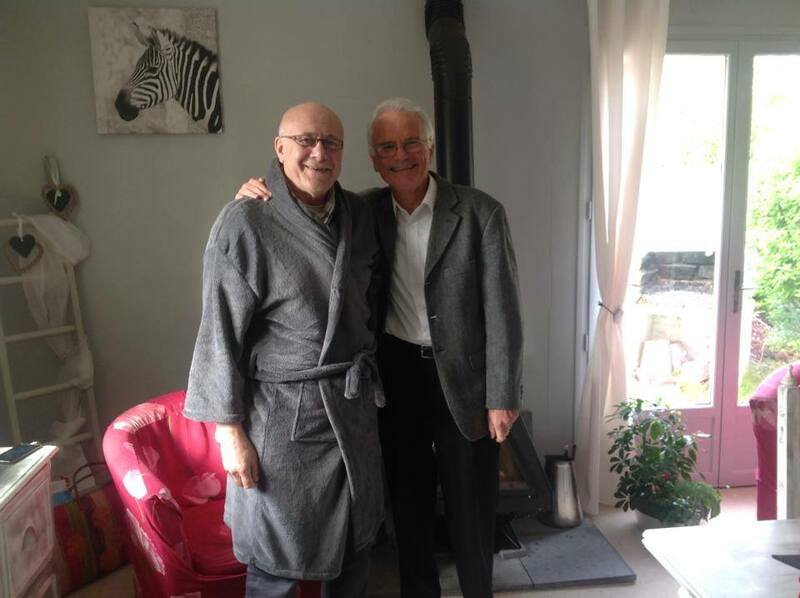 Next month we clock up 30 YEARS OF FRIENDSHIP AND CLOSE PARTNERSHIP IN MINISTRY IN FRANCE! 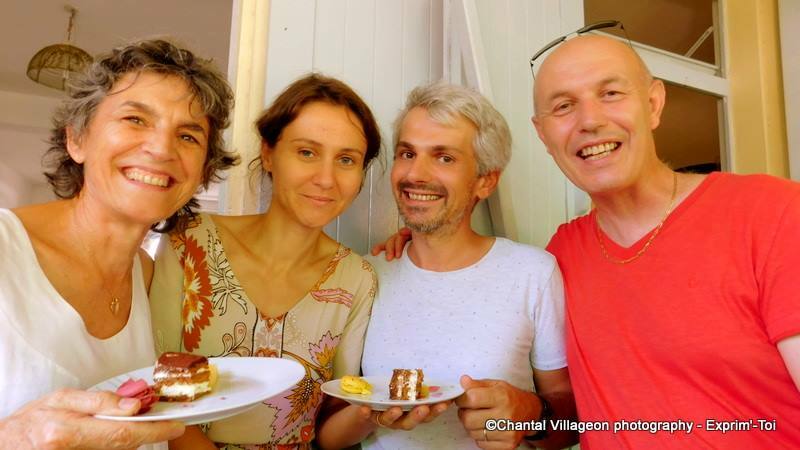 These are our friends and fellow-workers, Antoine and Christiane NOCEK. We connected up in a meeting in Paris in April 1987. 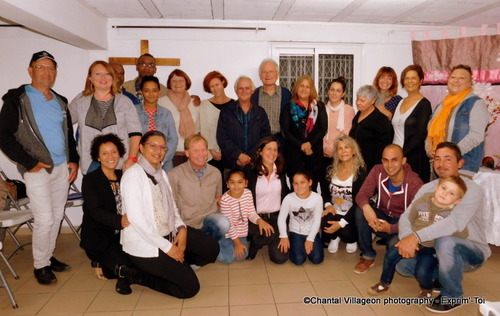 Since then we have pioneered many churches together and launched two movements of churches in France. 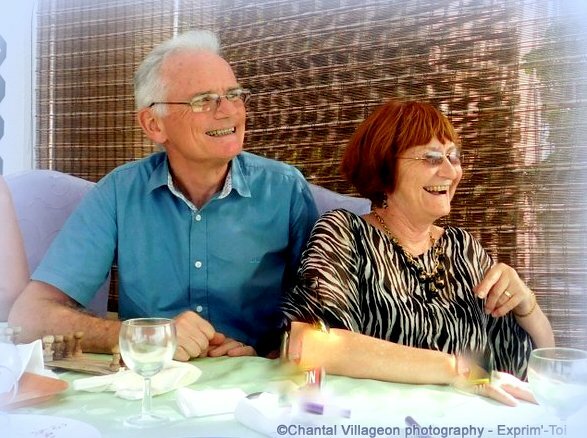 We have faced much opposition together in our pioneer work and Antoine and Christiane have endured cancer and a heart attack that was nearly fatal. YET AFTER ALL THESE YEARS AND THE MANY TRIALS WE ARE STILL AT IT! We reckon we have a few more church plants in us before the finish line. IT'S AN ANNIVERSARY WORTH CELEBRATING! 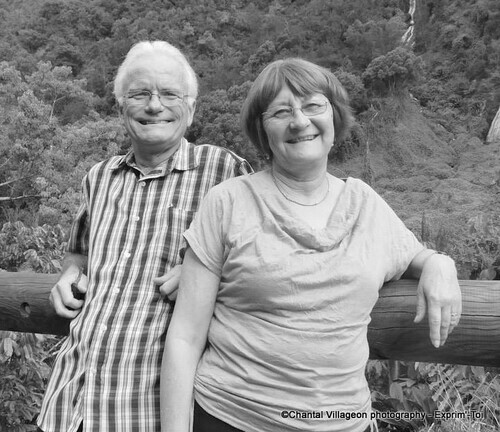 TOMORROW VINCE AND DENISE will have lived, served and laughed together for 38 YEARS. It's an old photo but a goodie! Happy wedding anniversary, my darling Denise! 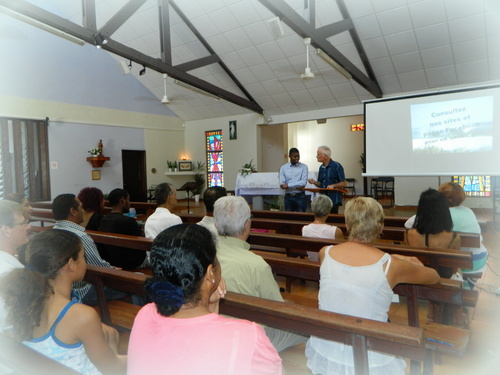 MAYOTTE - Vince preaching in French in Mayotte and being translated into the malgache language by my co labourer Rodolphe last Sunday morning. The lady who allowed us to use her restaurant came forward at the end of the meeting to commit her life to Christ. One young muslim man, clearly a practicing muslim by the mark on his forehead, came forward also, clutching his heart as the Holy Spirit moved on him. He immediately joined the young people as they jammed away on their instruments. How could you pass up a chance to experience this? It is glory! 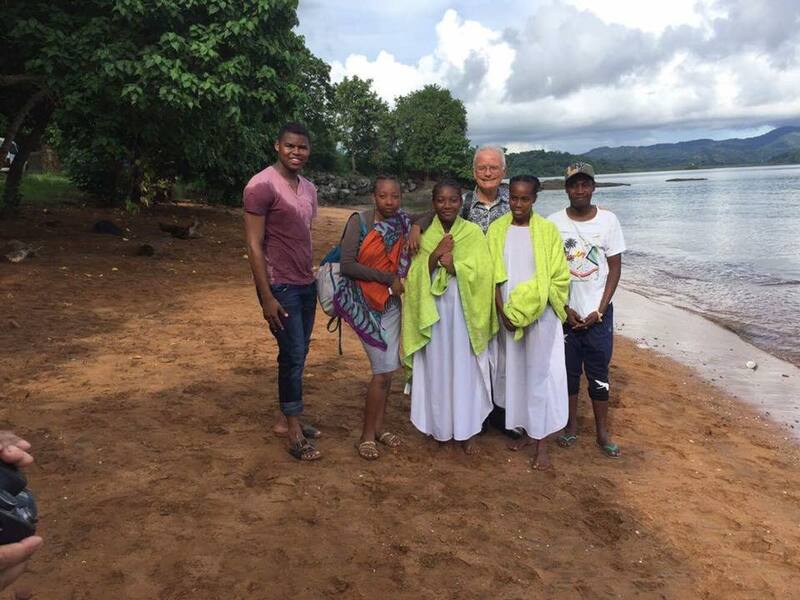 MAYOTTE - After Daniel and Rodolphe baptised 2 girls early Sunday morning they stopped, held hands and prayed in the waters of baptism for the salvation of Mayotte. Arriving in Mayotte. First meeting 25 people present. 12 came forward to give their lives to Jesus. This new church plant is off and running! In the middle there's RODOLPHE. He's 25 years old. He's the pastor of our church at St Denis, the capital of Reunion Island. He is an outstanding young minister of the Gospel and a real compagnon in the work for me. To the right is DANIEL. He's the leader of a small group on MAYOTTE which is a French island in the strait between Mozambique and Madagascar. Mayotte is 95% muslim! 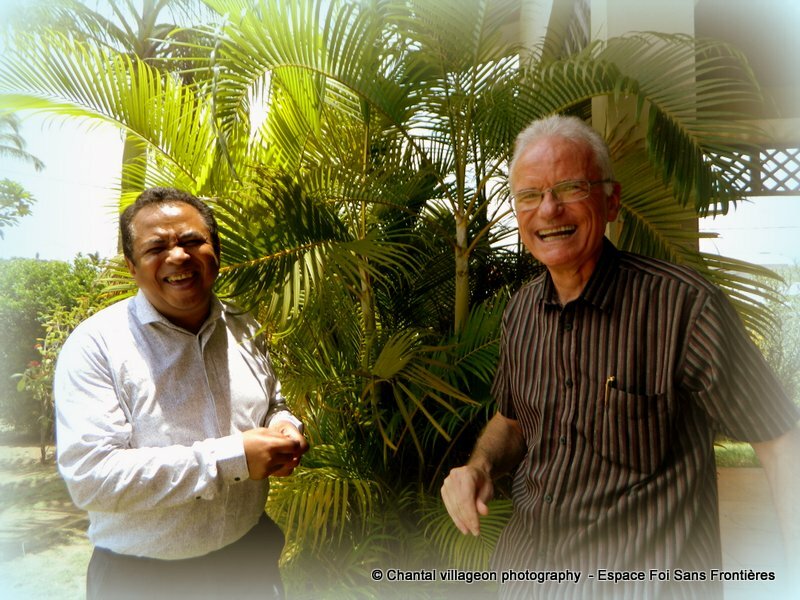 This weekend Rodolphe and I are flying to Mayotte to be with Daniel with the view of launching the church. 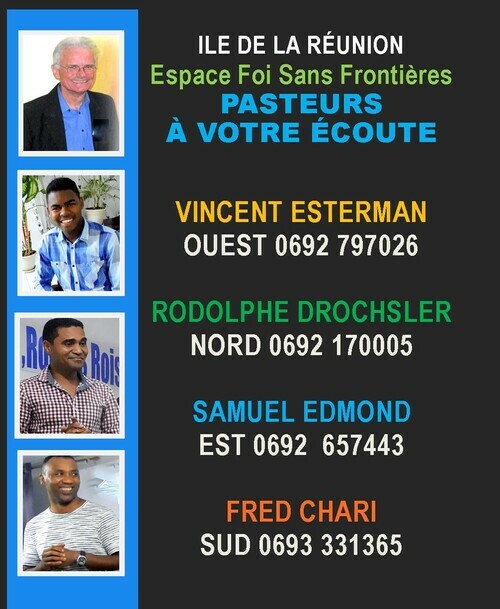 On the weekend of the 4th & 5th of March I will be on a REMOTE FRENCH ISLAND called MAYOTTE, situated between Madagascar and Mozambique, to launch a new church. This island is 95% muslim so it represents a great challenge for the local christians. 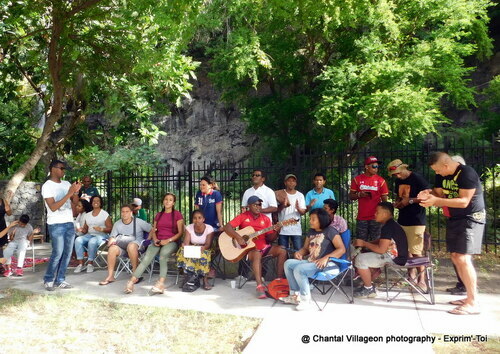 This is a photo of some of the young people waiting for us to come. Thank you for upholding us in prayer! Could you please pray for us! 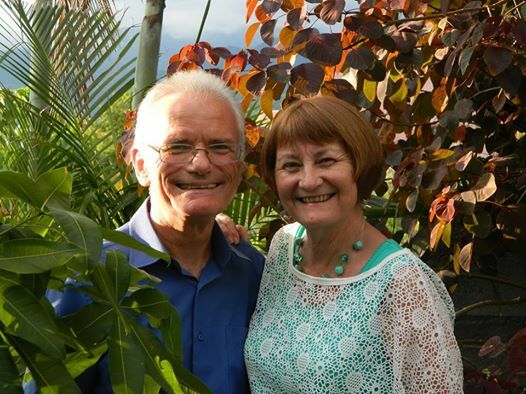 Vince and Denise are planting another church! 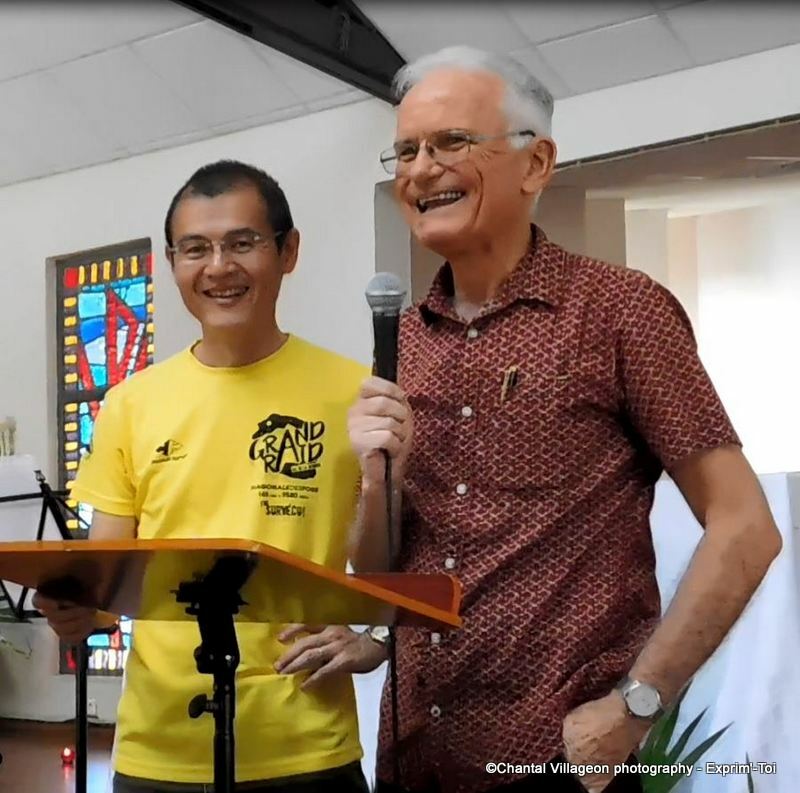 We have now 3 churches functionning well and growing on Reunion Island: one in the West, another in the North, in the capital, and a third in the East. Overall we gather about 200 people. So the glaring absentee is the South in the island's second city, St Pierre. We already have a Bible study group meeting every Thursday there but we are launching our first public meeting, and WHAT A NIGHT IT PROMISES TO BE! 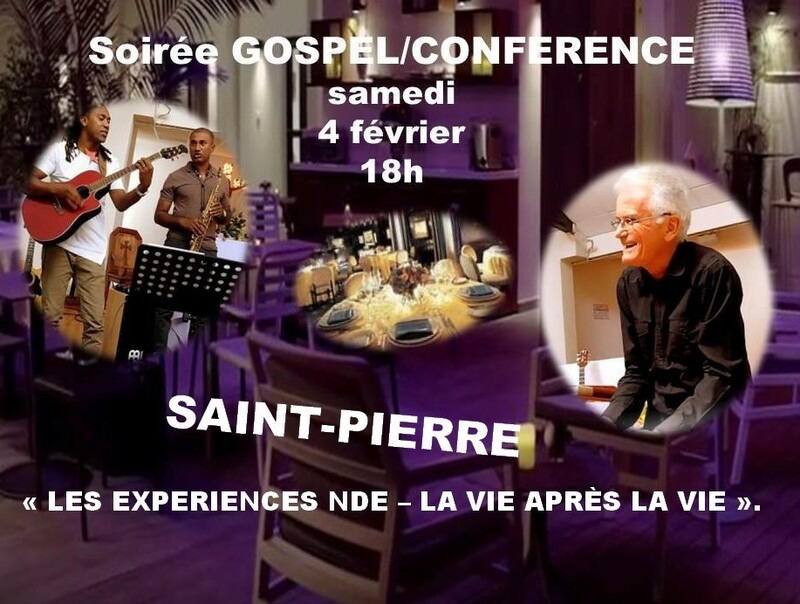 We will conduct it in a fancy hotel in the centre of town with some Gospel music followed by an exposé that I will bring on the subject of "Near Death Experiences". 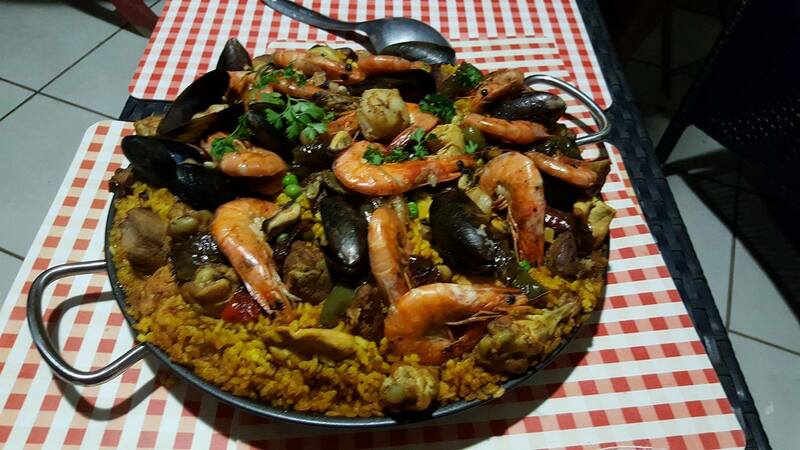 At the conclusion people will be invited to stay and have dinner with us at the restaurant which is laying on a special 3 courser for a bargain price. We have already 25 people registered for the meal with 2 weeks to go! This doesn't include those who will just turn up for the meeting. I'm expecting to be able to start a new church with this initiative which we will do on a monthly basis. 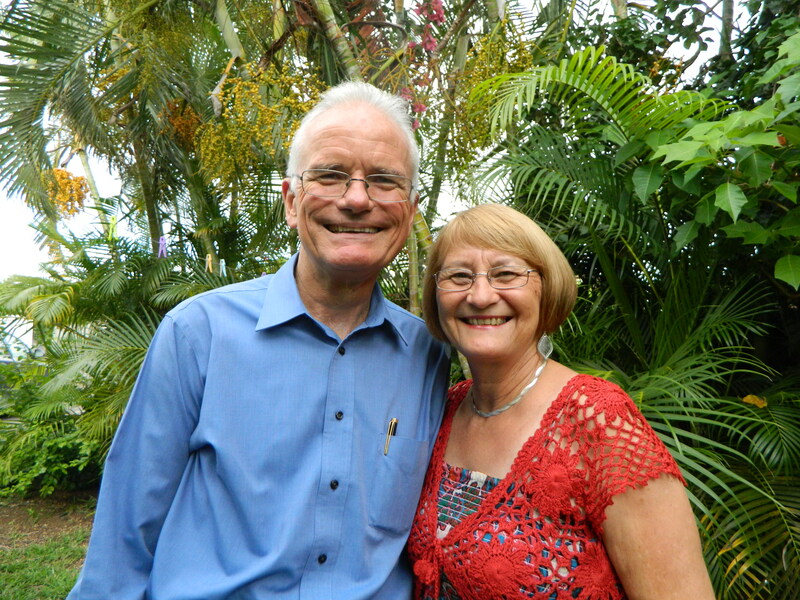 DENISE AND I HAVE BEEN PIONEERING CHURCHES FOR 40 YEARS. IT'S NO LESS EXCITING THIS TIME AROUND! « Hello, is this Pastor Vincent, Pastor Vincent Esterman? » It was an older lady’s voice. « Yes, it is. » I replied. That phone call launched our pioneer work on the French Island of Reunion in the southern Indian Ocean in January, 2013. With my wife, Denise, and our secretary, Chantal (all 3 nearing 60 years of age), we had found ourselves in the most awkward of situations. 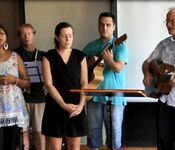 We had moved to Reunion Island from Australia after 20 years of church planting based out of Paris, France, which yielded around 30 churches throughout the country. This new chapter in the adventure which has been ours, came from an invitation by a church on the island to help train leaders to pioneer new works. Within days of arriving with a one-way ticket, we discovered a very insecure leader who had changed his mind about the invitation. We would have to go it alone. 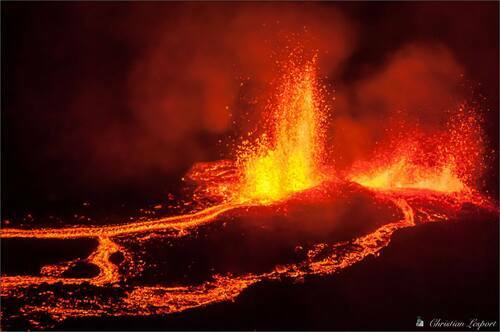 Reunion Island is an active volcano which erupts several times each year and is unheard of other than in France. Its one moment of international fame was in 2015 when the first piece of debris from MH370, the vanished Malaysian Airlines flight, washed up on our shores. The population is around 830,000 and, as the name suggests, is a melting pot of races and religions: Creoles, Tamuls, Muslims, Chinese, French ex-pats. It’s a pin-prick on a map of the world which, if you look carefully, you will find between Mauritius and Madagascar. The lady who rang had received one of 18,000 flyers the 3 of us put in letter boxes up and down the west coast. On the side of a volcano that took a lot of steep climbing! 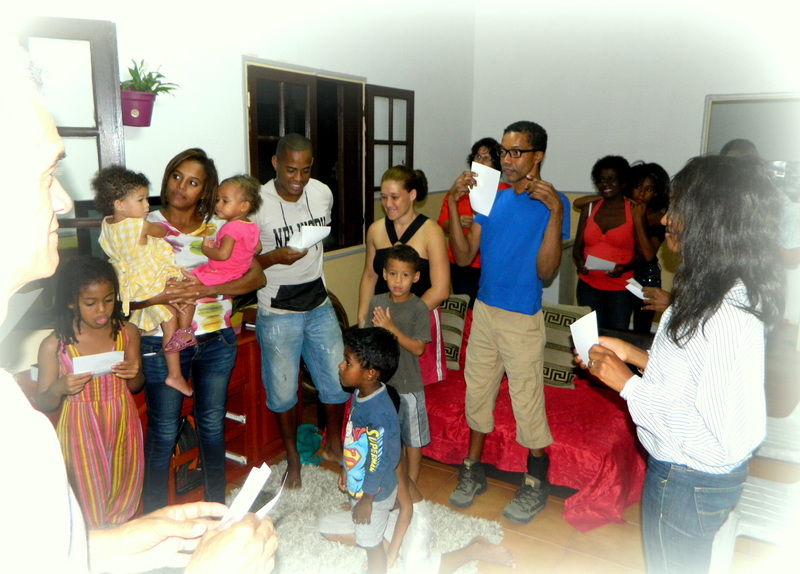 It was in her home that we held our first Bible study. It was a Monday evening and, just before we began the meeting, my phone rang. It was another lady who had received a flyer. After I explained to her who we were, she asked when there would be a meeting she could attend. I replied, « In your area, it’s in 15 minutes ». She said, « I’m on my way. » She came and gave her life to Christ. She’s a medical doctor with her own practice and is very much part of our young congregation. A group of Christians from Madagascar living in Reunion, approached us to help them plant a church in their native language. They hired a hall and now number over 100 on Sundays. I conducted the young leader’s wedding and ordained him to the ministry. This is our second church on the island. Apart from the flyers, photos and news posted on Facebook have very much helped the work we’ve done. We were contacted by 3 families from the east coast who had been following our posts. 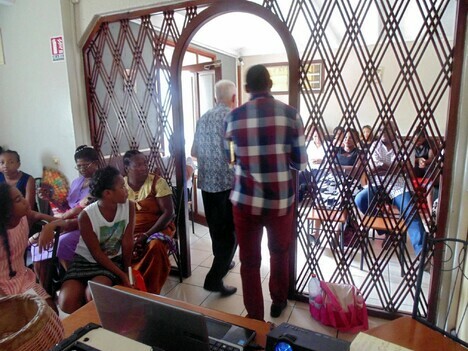 They also asked for help to launch a church which is now off and running with their own hall and around 30 attending. Wonderfully, whole families are coming to the Lord. 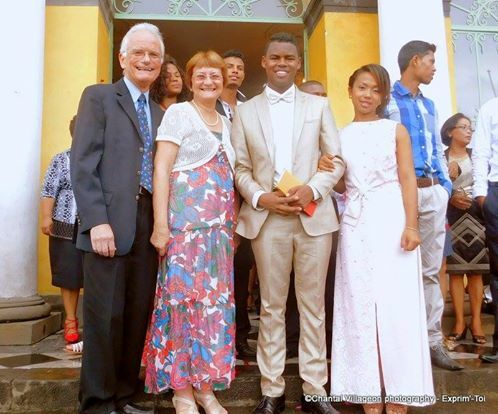 We ordained the young couple leading the work in September. Denise and I have been doing this for nearly 40 years and can confirm the accuracy of the scripture that says, « Cast your bread on the surface on the waters, for you will find it after many days. » (Eccl 11:1). One man turned up to our service. He happened to be the newly-appointed head of a major government agency. His wife had been filled with the Holy Spirit in a meeting I had conducted on the French Riviera in 1987! Another man came to a service, having heard my sketchboard stories on the seafront. 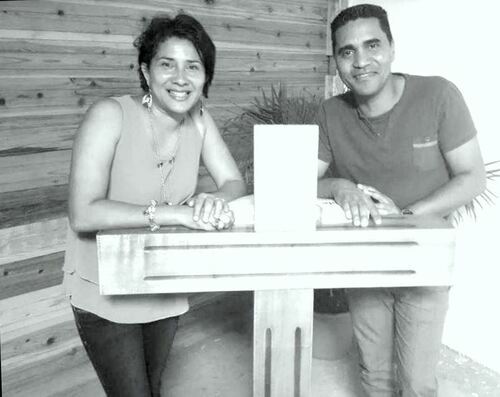 He gave his life to Christ and shares his faith in Jesus with the many who work with him in an internationally-known health products company, of which he is the head on the island. In the Mozambique Strait there is a French island called Mayotte, just a 2 hour flight away. The particularity of this island, which is even smaller than Reunion, is that it is 95% Muslim - a real challenge for any would-be pioneer. 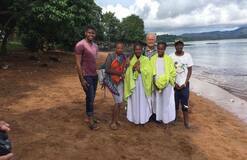 One man, who follows us on the internet, contacted us about starting a church on Mayotte. 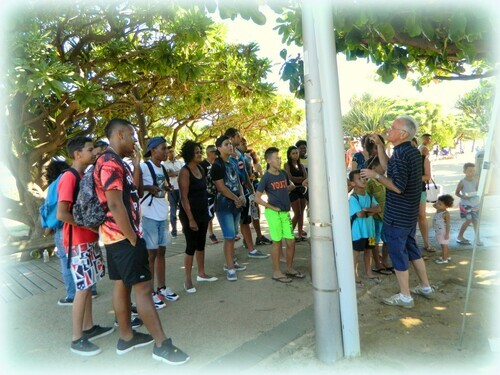 There’s a new window of opportunity on this island as many of the young people go to France to study and come back no longer under the shackles of their religion. A group now meets regularly in the capital. I remind myself of the importance of this work with the words of Jesus, « The Kingdom of heaven is like a mustard seed which a man took and sowed in his field » (Mt 13 :31). Now into our 60’s, I wouldn’t have expected to be still sweeping halls before church or leading meetings with my guitar for lack of musicians or having to carry the finances while teaching people on giving to God’s work. Yet we only have one chance at life. Somehow, we have to make it count for eternity. REUNION ISLAND FOLKS, THE REUNION ISLAND VOLCANO HAS ERUPTED! But no worries, the population base is far from the lava stream. But we ARE sitting on an awful lot of firepower. I'D LIKE YOU ALL TO MEET SAMUEL AND HORTENSE. Today we will be conducting a special service to ordain them to the ministry. 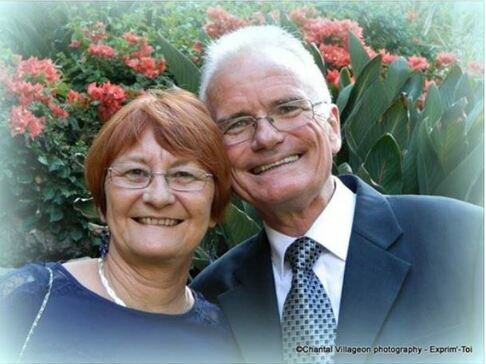 Samuel and Hortense are a wonderful couple who lead our church at Ste Anne in the east of Reunion Island. They have two children: Jérémie and Julie. Have followed us on Facebook for several months in 2015 they came to see me to share about the call of God on their lives. We started a new church with them and there are about 30 people attending already after 10 months. This is great for Reunion Island these days. They are full of faith and passion for God, powerful intercessors with a seemingly inexhaustible love for people. They minister together and we are so proud of them and the work they do. They will be the second pastoral couple we have ordained with more to come. GOD IS BLESSING THE WORK! Reunion island - THIS IS ONE INCREDIBLE PHOTO! 2 of these men I haven't seen in 20 years. 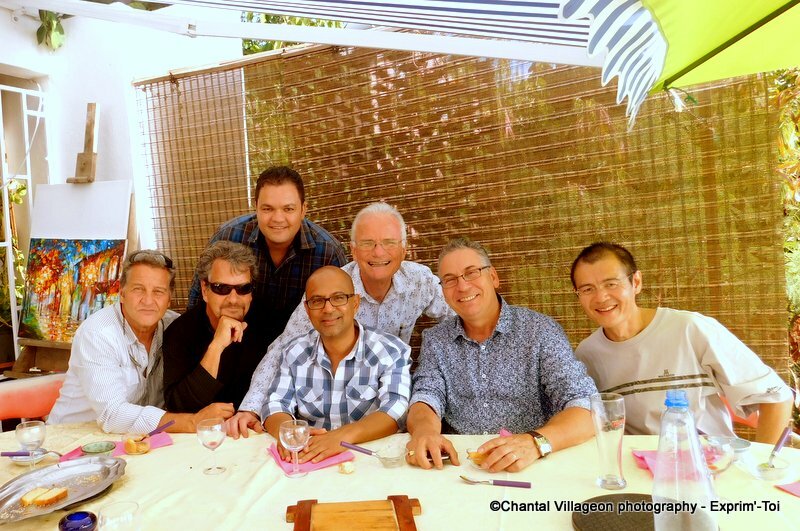 In fact Eric, just below my right shoulder, is the man I worked with in the early 90's to establish our first church in Reunion Island. Life has it's twists and turns and our paths were not to cross again until today when he, his wife Sylvaine and others came to our service to reconnect with us. 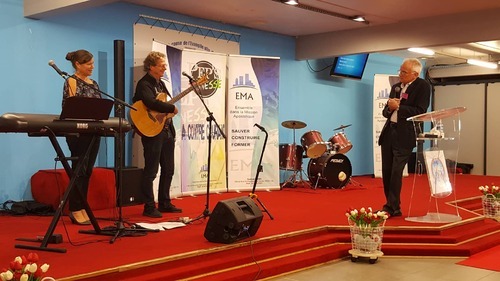 They are launching a new church in a different region of Reunion and would like us to be involved with them in this new project. God is doing a new thing! THIS MONTH WE CLOCK UP 4 YEARS OF PIONEERING WORK ON REUNION ISLAND. Here’s a bird’s eye view of where we are today. While we are still very much in pioneering mode we are making significant progress. After a particularly difficult first year we had to start the church again. We just couldn’t build with people we had. 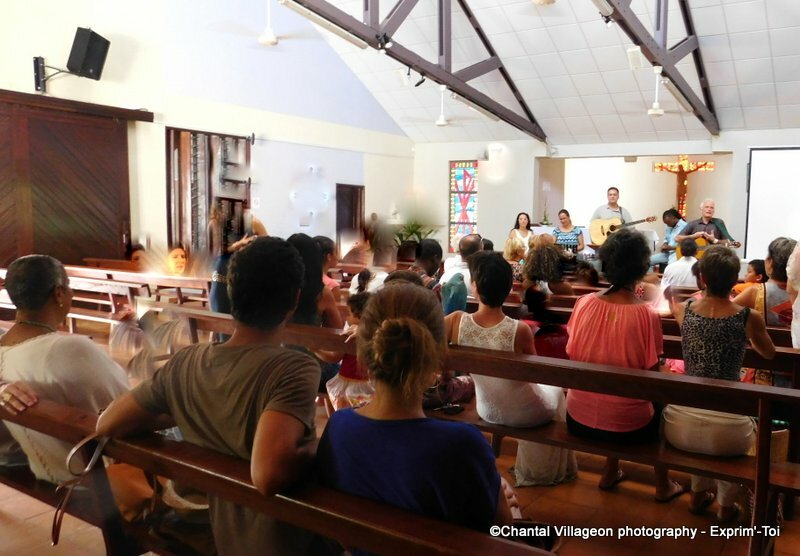 We relaunched the church in the west of the island where there are many French ex-pats and spent the next year dealing with the instability of many of the island folk. But since mid 2015 things have been turned around. We now have some families who are committed to working with us. In June of last year we helped launch a new church of Madagascan Christians in the north of the island, in the capital, St Denis. A young malgache pastor we ordained last year leads the work. 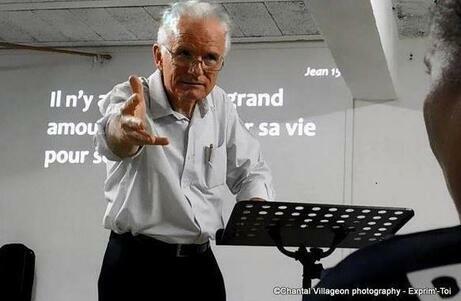 His name is Rodolphe and is an outstanding man of God. I conducted his wedding to Vony back in February. 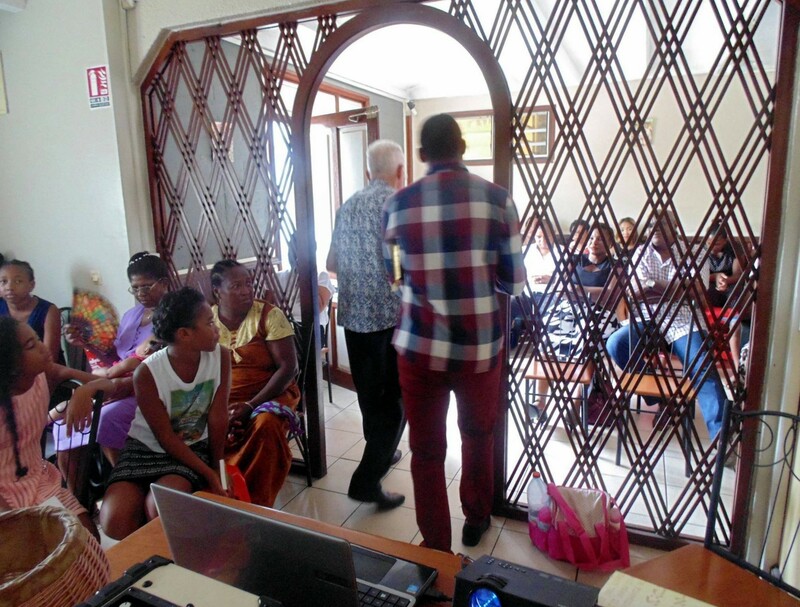 Then in October 2015 a number of couples from the east of the island who had been following us on Facebook, came to a meeting and asked for an appointment. 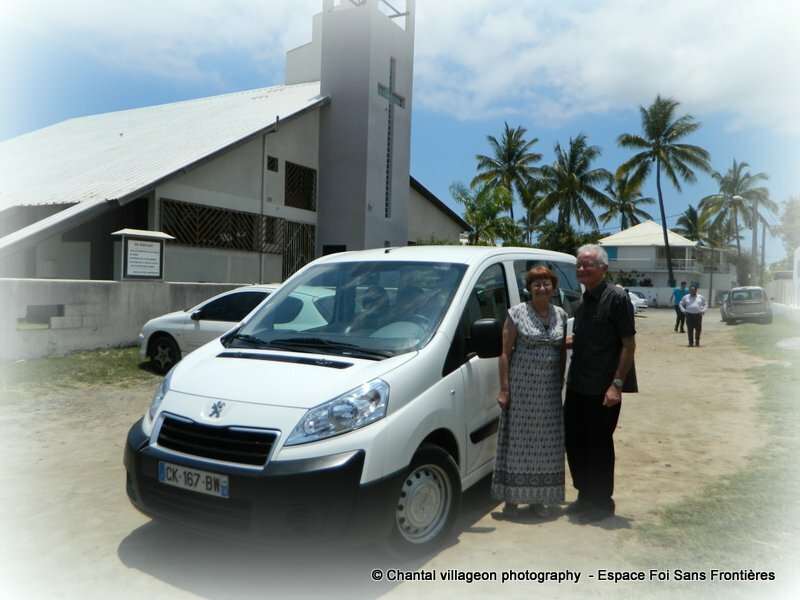 As a result we’ve started a new church in the east, in the town of Ste Anne (many towns on Reunion are named after saints). They are doing very well and gather around 30 for their Saturday evening service which I take once a month. 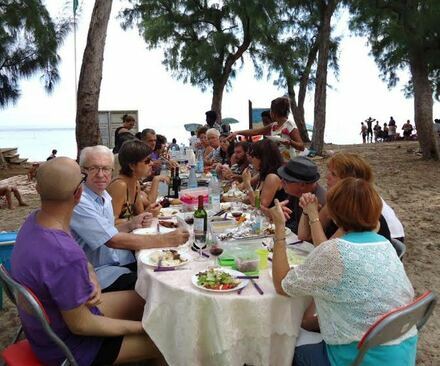 Once a month they travel to the west to join in our service then we picnic together on the beach. The name of the couple who lead this work is Samuel and Hortense. They also have a real call of God on their lives. On the 4th September this year we will ordain them to the ministry. In March I went to Madagascar to conduct a school for soul-winners with 800 leaders present. 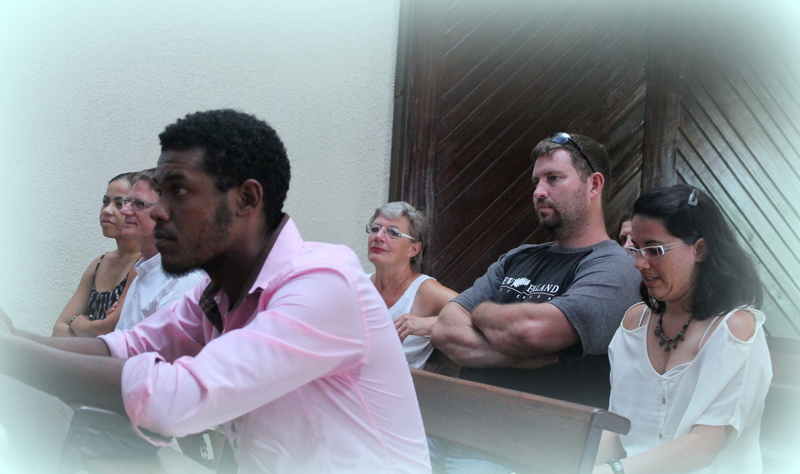 A man from the French island of Mayotte, the same southern Indian ocean region, attended. 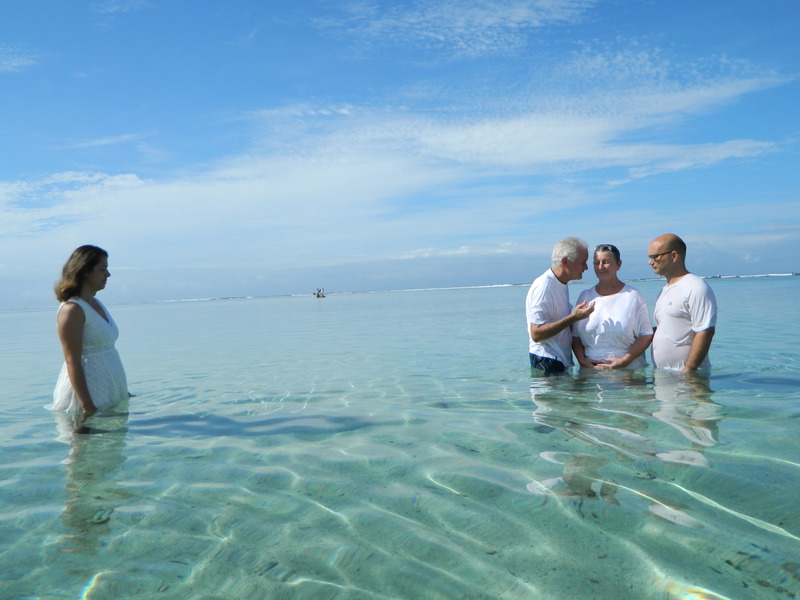 We are now helping him establish a church on his island. There are about 25 in attendance. Mayotte is 95% Muslim so it’s a real challenge for him. His name is Daniel. 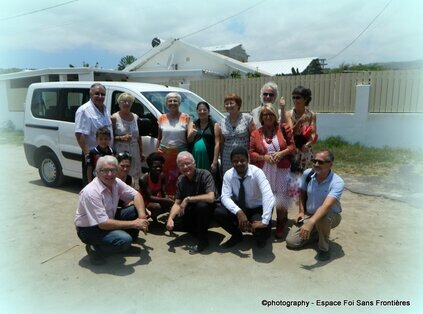 Last week 10 people from the south of Reunion turned up at our service in the west. I hadn’t seen 3 of them in 20 years. One was a former pasteur I had worked with on the island to start the first church 25 years ago. They have started a new church in the south and are looking to me for help and encouragement. 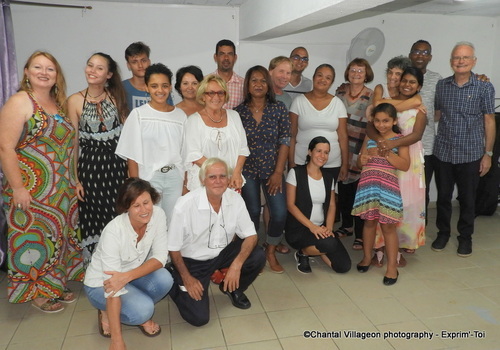 Then last Friday a couple from the north eastern town of Ste Marie invited us to lunch to talk about opening their home to start a group that would be under our covering. So, much is happening. We are having to fight for each salvation but we have several wonderful trophies of grace among us, especially some men, which has always been a distinctive feature of our ministry. Denise is training children church workers and we’re working on developing worship teams which is a real need on the island. Leadership training is also a priority. 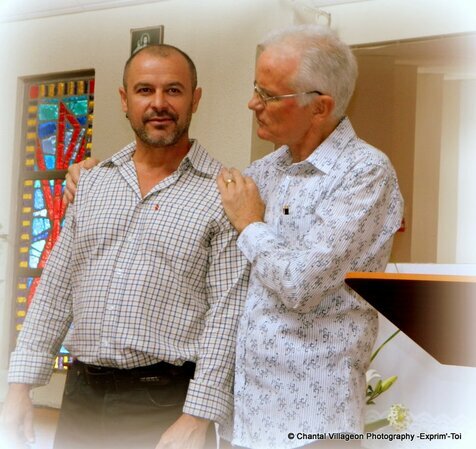 Last month I conducted a day seminar « Growing together in the ministry » for all our leaders. About 30 were present and there was such a great spirit in the group. 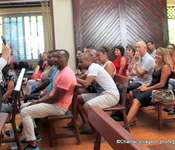 Financially, it remains a challenge because of the mentality on the island. It is heavily dependant on hand-outs from France so there is an ingrained mentaliy of receiving help but not giving. We’re working on this as well but there is resistance, so we have to carry it ourselves. Denise joins me in sending love, greetings and thanks for your interest in our work, God bless. 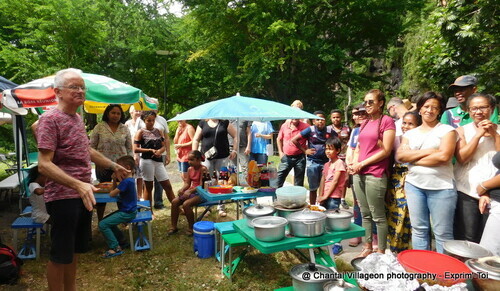 The family day with special activities for 25 young people didn't get off to a good start. Storms rolled in and all the shelters were taken by other groups. So we all ended up in the toilets. We looked at it positvely - we had a shelter with our own onsuite. But we could have done without the smell. DENISE looks as if she's been arrested and jailed. Anyway, the sun returned and we had such a great day with all the young people. 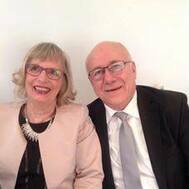 We are not referring to a wedding anniversary but to the day Vince and Denise Esterman arrived in France with no return ticket, after 9 years of ministry in Australia, in order to respond to God’s call. It was the 30th June 1986, a momentous day when Vince and Denise landed at Marseille airport to begin what has been an amazing adventure. 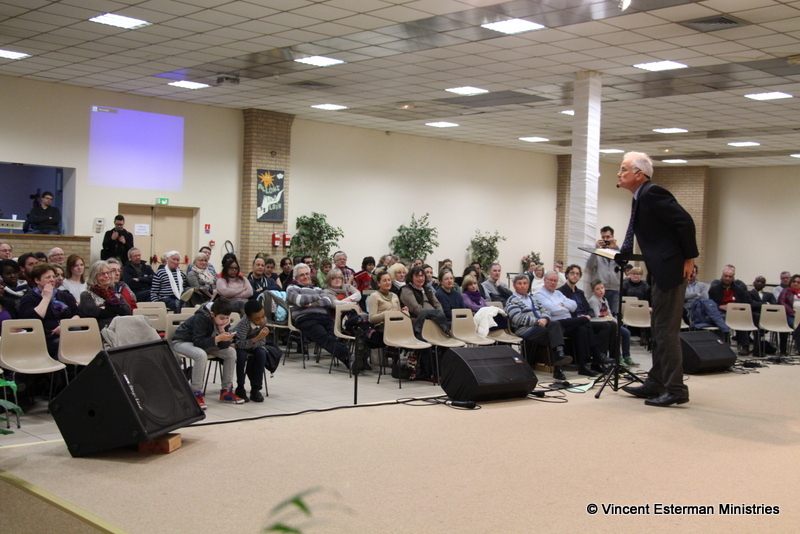 30 years of preaching the Gospel - seeing countless numbers of people come to Christ, several dozen men and women trained and released into ministry leading churches today, and churches planted in a number of regions in France. But also 30 years of having to face opposition, sometimes fierce, coming from all quarters and adversaries who rose up against us in the work we did. And we are still at it ! Our goal has not changed one bit – there’s still another soul to be saved out there. We, Vince and Denise, would like to express our deep gratitude to God for His faithfulness and goodness to us over all these years. And thank you to all our friends and fellow workers who have remained faithful to us throughout this journey. But the race is not run ! There’s still a way to go before we cross the finish line. So we press on reaching out for the prize that awaits us. Reunion island - FACEBOOK FRIENDS, THIS IS TOO GOOD NOT TO SHARE!!! 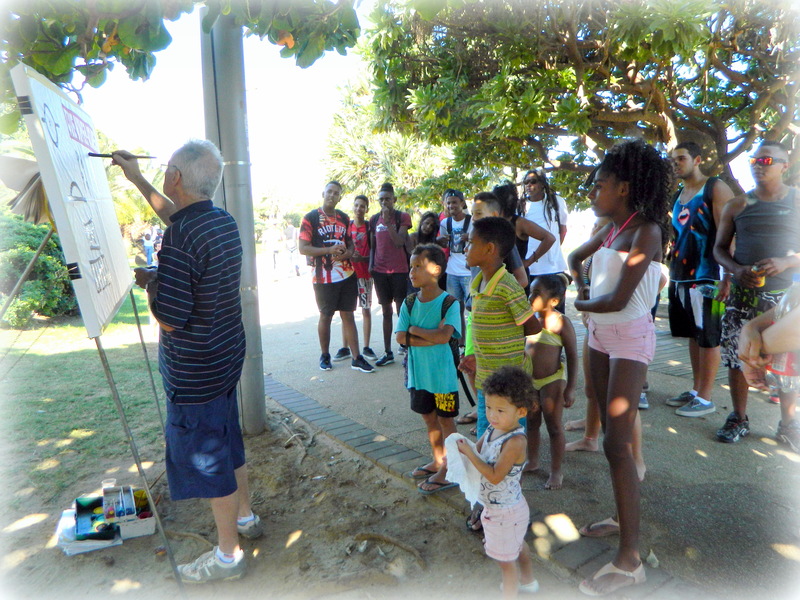 As you might know, one of my special activities over the last 30 years has been going out on the streets of the cities of the world with my sketchboard to tell short stories and share the incredible message of God's love for people. I reckon there have literally been hundreds of thousands of people who have heard me. Well, last Saturday I took the board out on the seafront at St Pierre, Reunion Island, where we live. I had lots of kids sitting at my feet enjoying my stories. Right at the very end a couple stopped, caught the tail of my last story for the day and asked for a flyer. 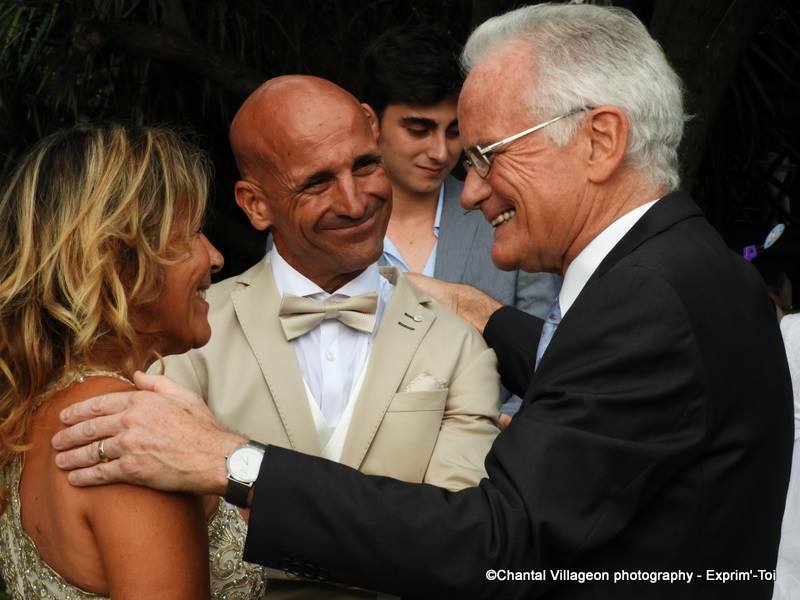 Chantal, my PA, chatted with them and to her surprise, the couple said, we'd like to come to your church tomorrow. Our service is not at St Pierre but 40 minutes drive away. Well the next day they were in the service with their two children and at the end of my message both husband and wife gave their lives to Christ! 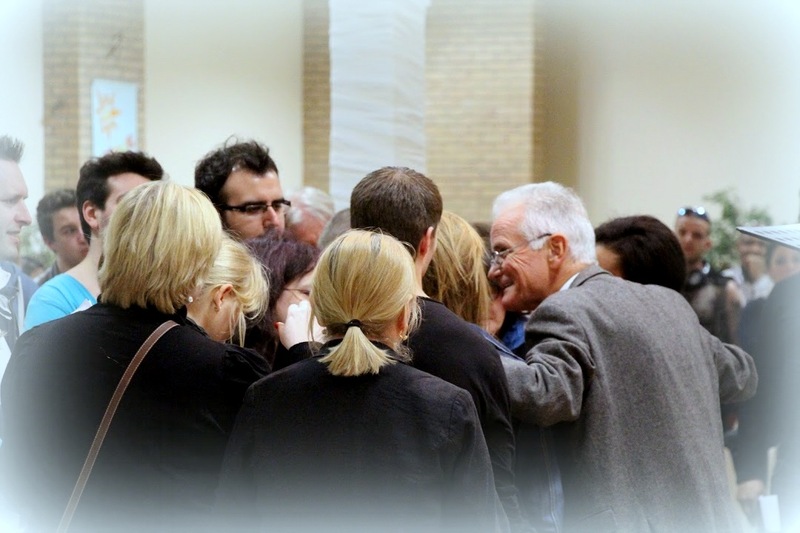 The congregation was stunned and many had trouble holding back their emotions. As they left after the service the couple said "See you Thursday at the Bible study". Winning people to Jesus can be SO simple sometimes. A FEW YEARS AGO I PUT OUT AN ALBUM OF MY OWN SONGS. They're all in French but you may like the melody. The title of this one is "When I gaze up at the stars". My secretary is putting them all on Youtube at the moment. 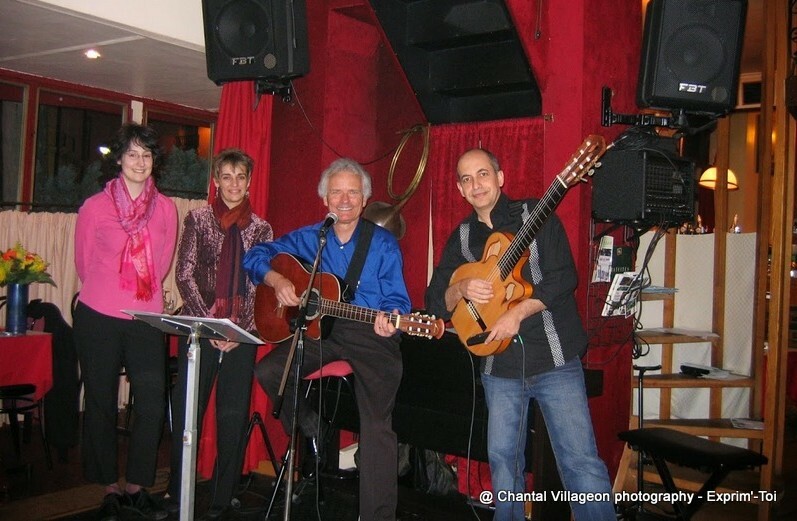 When living in Paris we did a few concerts in piano bars. IT WAS QUITE AN EXPERIENCE. Trying to reach people for Jesus I guess we've just about done everything! 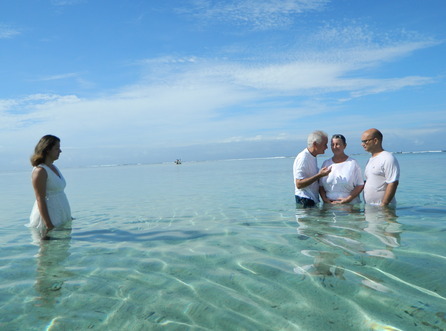 TODAY WE BAPTISED 4 MEN AGED BETWEEN 49 -53. All of these guys have been saved in our church in the last few months. The ladies love to see the men go on for Jesus. 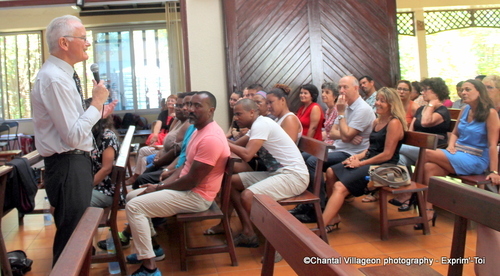 All the non christian friends who came for the early morning baptism service stayed on for our Sunday service. There were as many non christians in the meeting as there were Christians! iT WAS GREAT! Then we went to the beach for a picnic and conversations just flowed about faith in Jesus. When I saw a bunch of young people on their motor bikes i went over with a bowl full of sausages. I made lots of new friends with these sausages. REACHING OUT TO PEOPLE CAN BE SO EXCITING! 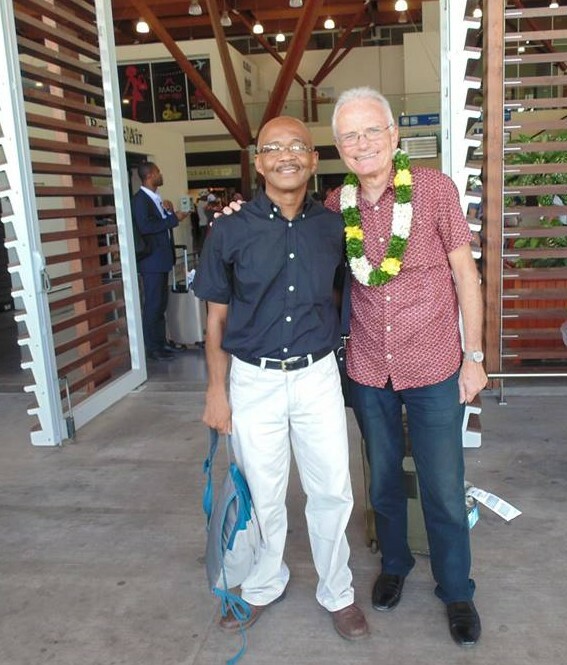 Reunion island - TO MY LEFT, A LIVING LEGEND! 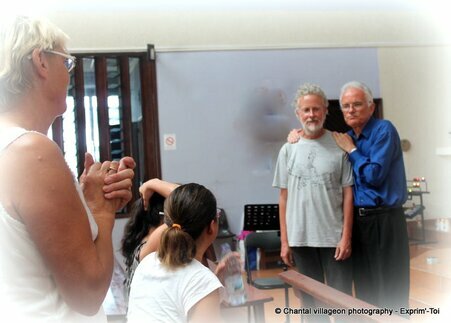 Here are some photos just sent through from the school for soul-winners I conducted last week in Madagascar. Around 800 were registered and the enthousiasm crackled like pine cones in an open fire. In the first photo, to my left, is Pastor Jules. 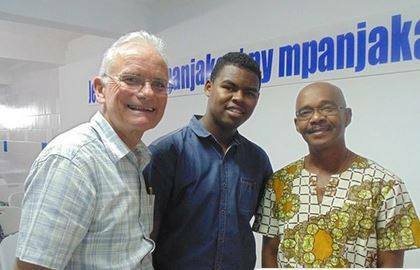 From being a humble keeper of cattle God took him, saved him and sent him to preach to his own Madagascan people. 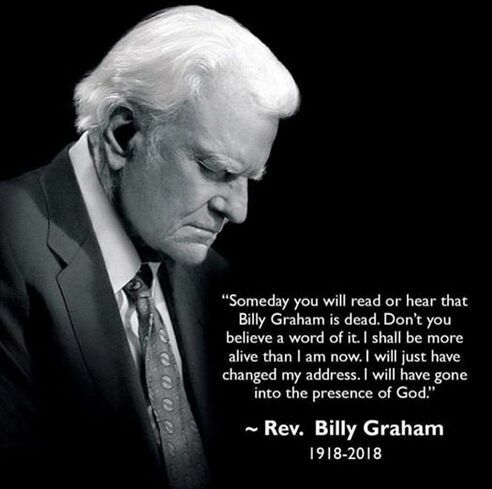 His preaching brought revival to the whole country in the 70's and 80's. There are realistic estimates of 2 million people won to Christ and in churches today as a result of his ministry in a national population of 23 million. We now work together to help move the churches back into outreaching mode. 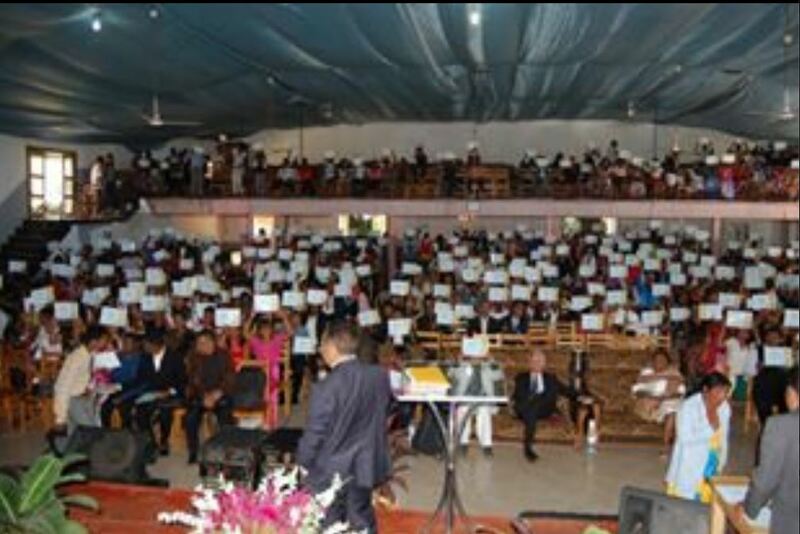 IT WAS A MOST SIGNIFICANT WEEK.Madagascar 5 DAY SCHOOL FOR SOUL WINNERS... 1,100 LEADERS ARE REGISTERED!! OVER CROWDED CLASS SIZES, up to 800 students! This is my school for soul winners in the city of Antsirabe, Madagascar. Many pastors and church leaders are involved from around the country but many young people also wanted to be in on it. They all really got a hold of "sowing systematically" hence the comments "systematiquement!". Yesterday afternoon around 60 people were powerfully filled with the Holy Spirit, including one pastor. These people bring out the best in me. 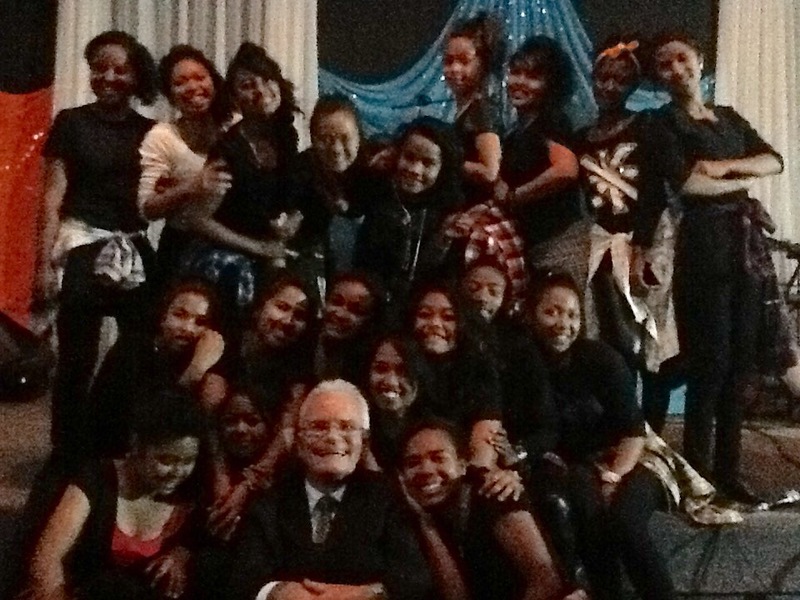 Thank you Lord for the malgache people!! 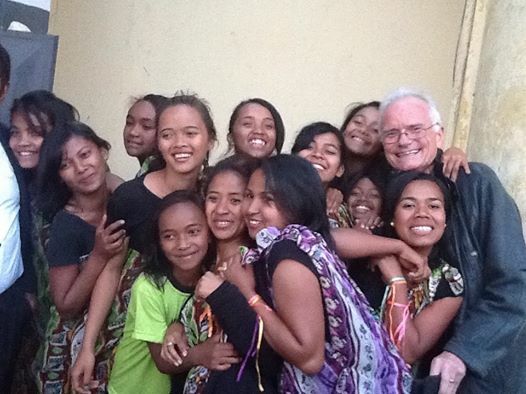 This is my school for soul winners in the city of Antsirabe, Madagascar. Many pastors and church leaders are involved from around the country but many young people also wanted to be in on it. They all really got a hold of "sowing systematically" hence the comments "systematiquement!". 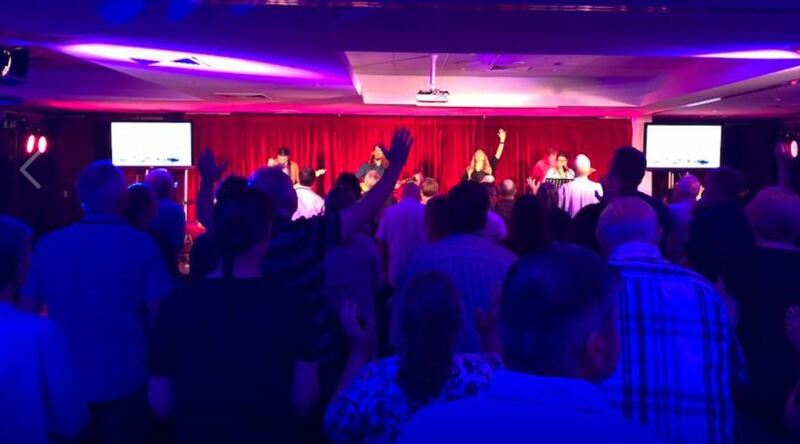 Yesterday afternoon around 60 people were powerfully filled with the Holy Spirit, including one pastor. These people bring out the best in me. 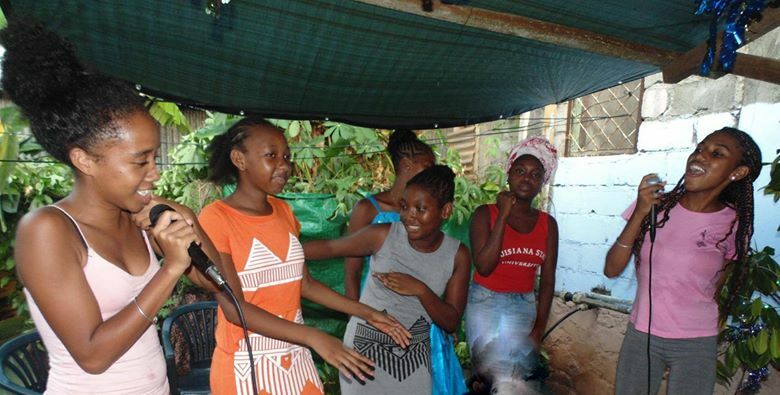 Thank you Lord for the malgache people! TUESDAY I FLY OUT TO MADAGASCAR WHERE I WILL BE CONDUCTING A 5 DAY SCHOOL FOR SOUL WINNERS... 1,100 LEADERS ARE REGISTERED!! Madagascar is an amaing place. It's a very poor country yet never have I seen New Testament Christianity lived out as in the people here. Such fervour, respect, humility and commitment. 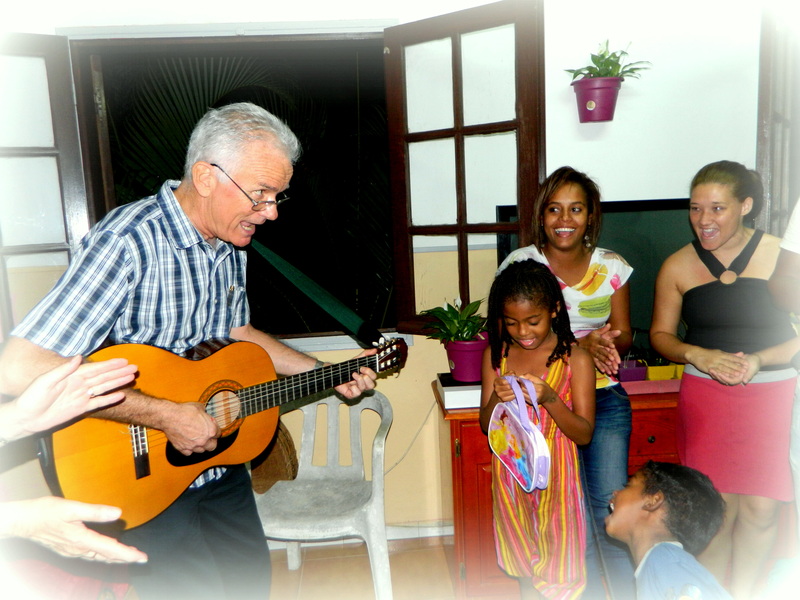 I'm amazed that the "Malgache" people who have so much to teach me about living for Jesus ask me to come to minister to them. It will be quite a week, next week. 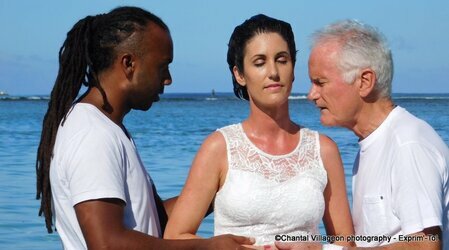 Reunion Island - This morning we baptised Alicia, who is a well-known TV presenter on Reunion Island. She gave her life to Jesus in our church in January. Several of her friends were in church this morning and heard her testimony about how the Holy Spirit impressed upon her about viewing the film "The Passion of the Christ". When she did she was powerfully impacted by the Holy Spirit and her life was transformed. Exciting days! 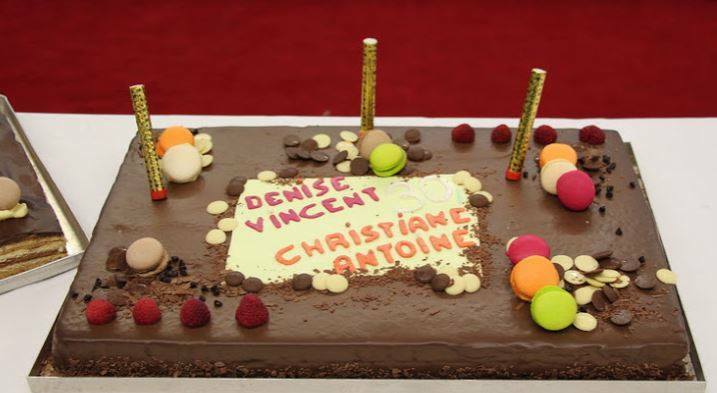 TEAM VINCE AND DENISE was born on this day, March 10th 1979. We were married in Brisbane at Christian Life Centre, Fortitude Valley by Pastor Trevor Chandler, who sadly left us some time ago. It was a beautiful day and when Denise walked into the church it took my breath away. Since that day, it's been such a great story. Many young people can't believe that two pople could be happy together for 37 years, love each other and look forward to many more years. But for both of us the best part is that we are making a difference in so many lives as we share the love of Jesus in different parts of the world. Long may this blessed adventure continue! REUNION ISLAND - Meet this young couple, Rodolphe and Vony. Rodolphe is the pastor of our Madagascan church in St Denis, the capital of Reunion Island. He is 25 years old and is such an outstanding young man. His wife is a very dedicated Christian woman. They were married civilly today and tomorrow I will be conducting their Christian wedding. It is the first time that I have a real Timothy. I am so proud of them. on streets, in parks, on beaches, in shopping centres and malls, on university campuses, in schools, in churches. From the West Indies to Florida, from the Arctic circle in Norwa, Sweden and Finland to Paris via Rotterdam and England, Adelaide, Reunion Island, I've travelled far and wide with my old friend, my sketchboard. How many people have heard me speak of the love of God in these public places?...conservatively, 150,000. Perhaps my best response was a man called Ramon who heard me at the beach at St Pierre in June of last year. He was deeply moved by what he heard and came to church. 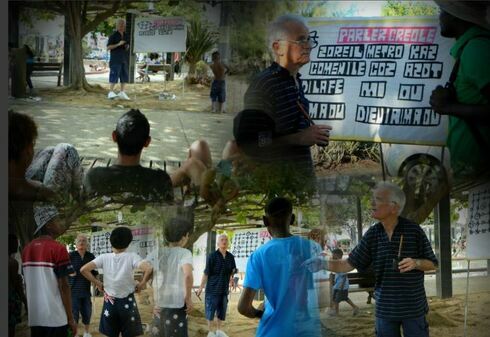 His life was turned around and he keeps bringing new people along to share with them his new-found faith in Jesus. 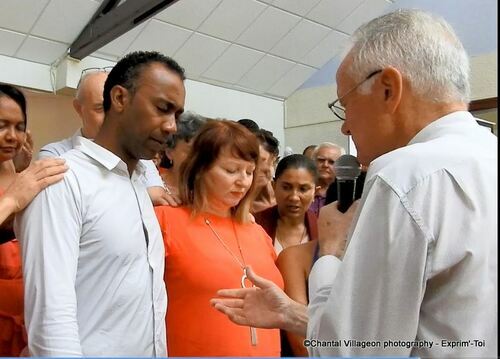 From a very nervous beginning in 1986 int the streets of Nimes in the south of France to today in Reunion where the nerves still kick in each time I go out, I thank the Lord for His promise to be with us as we go, till the end of the age. Pastor, Evangelist, Conference speaker, Street story-teller and equipper of churches to bring in the Harvest. Who is Vince Esterman ? Vince Esterman was born in Sydney, Australia, in 1954 to French parents. 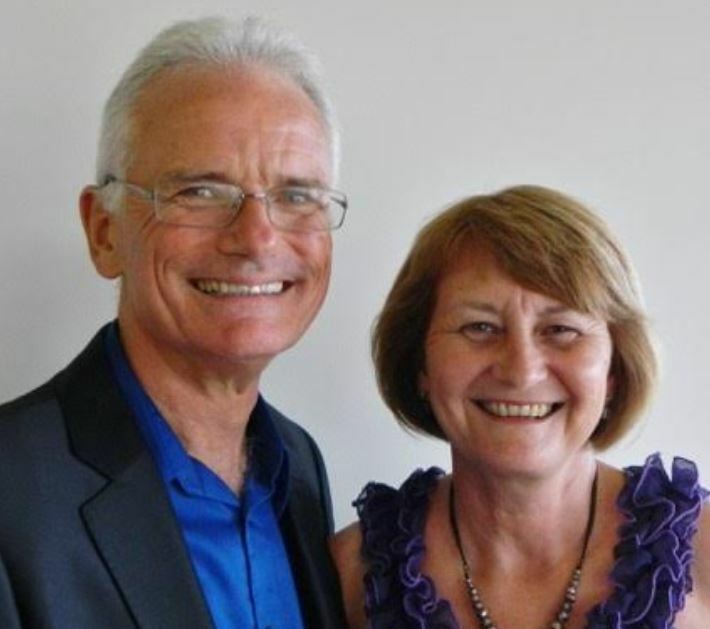 Having pioneered and pastored churches in Queensland, Australia, for 9 years, he moved to France with his wife, Denise, in 1986. For 21 years, they planted a number of churches in France and Belgium, including one in the heart of Paris which he pastored for 11 years. 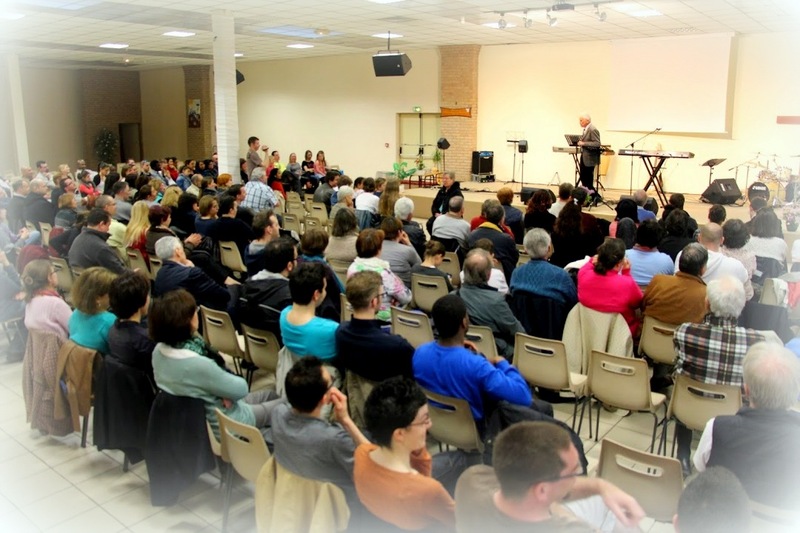 Successful church-planting in France required an understanding of reaching the secular mind and touching Gospel-resistant hearts. 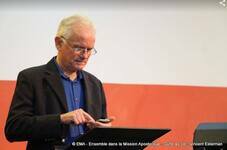 The many conversions he has seen bear testimony that Europeans and Western populations can be won to Christ in today’s world. He has authored several books, which have been translated into French, Norwegian and Swedish. 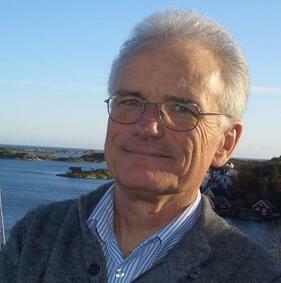 His books encourage people to think about and re-evaluate what evangelism is all about. The style is refreshing as he looks at life and people joyfully. Well-known Biblical truths are rediscovered from new angles and applied in sometimes surprising ways. 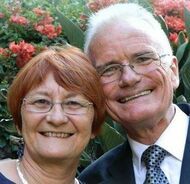 The Estermans returned to Australia in April, 2007 and have settled in the city of Adelaide with the view of establishing a ministry base from which they could travel back to Europe and beyond, as well as partnering with Australian churches. Vince conducts equipping seminars for churches entitled “Sharing your faith, and actually enjoying it !”, teaches in Bible Schools, speaks on relevant topics at evangelistic events and motivates churches to once again take up the cause of the Gospel. His approach is relaxed and non-confrontational, yet searching for response. He believes that we must earn people’s trust and win the right to be heard. There’s nothing quite like seeing a person come to Jesus publicly and then be added to the church community. This is Vince’s ultimate goal to which he has devoted over 36 years of his life. 2016 - What a moment to savour! WE GOT ONE AND IT'S A BEAUTY! 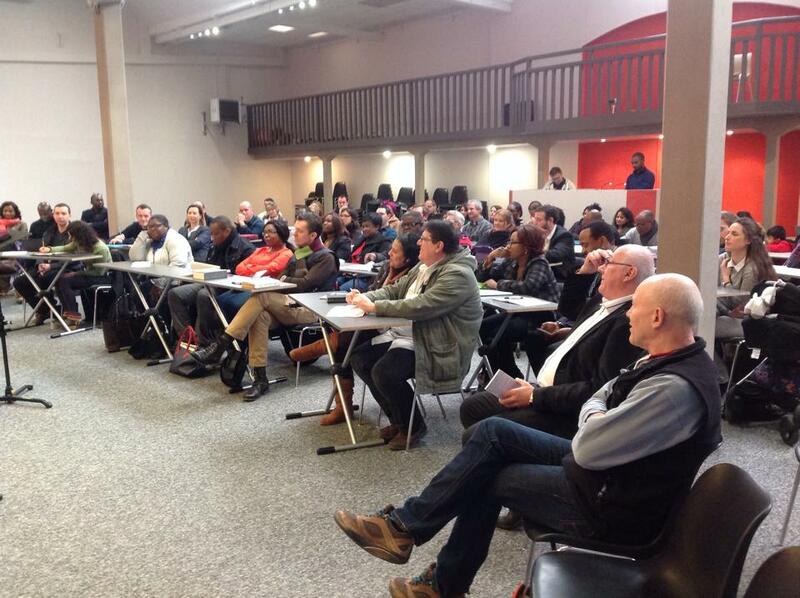 5 weeks ago God put a thought in my mind about launching a fund for a bus to bring people to our services. 5 weeks later the thought has become reality. We are grateful to God for his incredible provision and we are so grateful to the 30 people, couples and churches who contributed to make it possible. It’s a PEUGEOT Expert 9 seater (which can be driven by anyone with a normal license). After seeing a number of dodgey buses and ringing around many of the dealers on the island only to be told that a quality used 9 seater was very rare and in great demand, we found one, and what a deal ! It’s a 2012 model with only 33,000 kms on the clock. Looks and drives like new. Our target was $25,000 (15,000€). We received in total $26,500 and we secured the bus for exactly $26,500 ! How is that for precision blessing. To register, service and insure the bus will cost us a further $1,700. PERHAPS SOMEONE WHO RECEIVES THE EMAIL UPDATES WOULD LIKE TO HELP US WITH THIS and round off an appeal that has left our young church stunned and amazed. 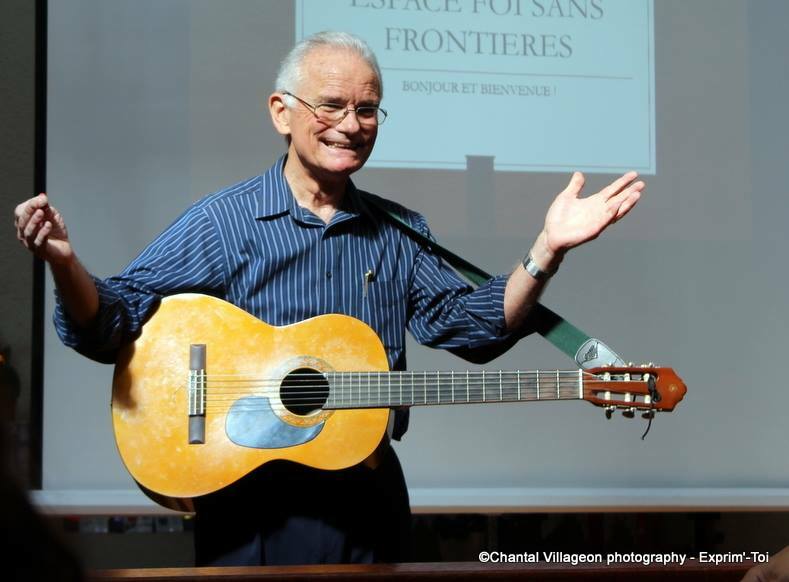 On behalf of all the people who attend our church (called Espace Foi Sans Frontières – Faith Without Borders) THANK YOU, MERCI BEAUCOUP ! 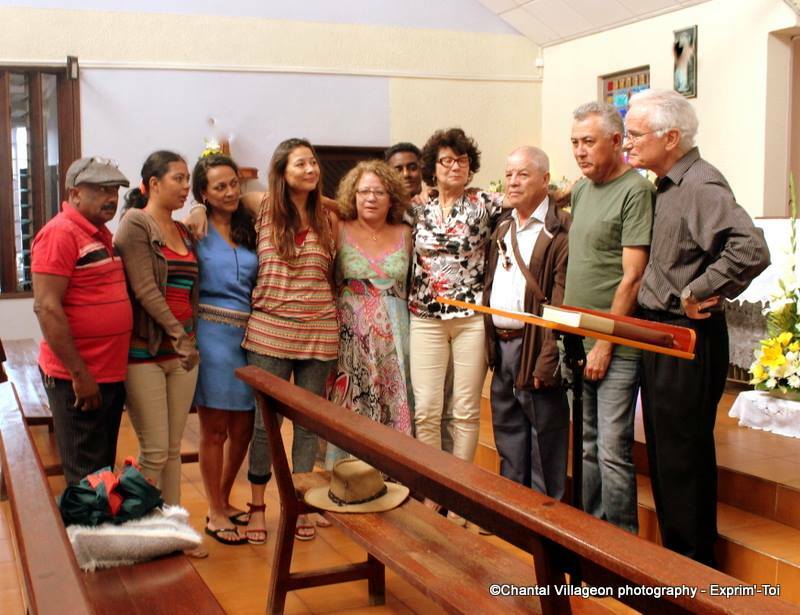 wE NOW HAVE THREE CHURCHES ON REUNION ISLAND! That's right! Our main church, which is not the biggest numerically, has been going 18 months if we don't count the year that wasn't. However things are accelerating. 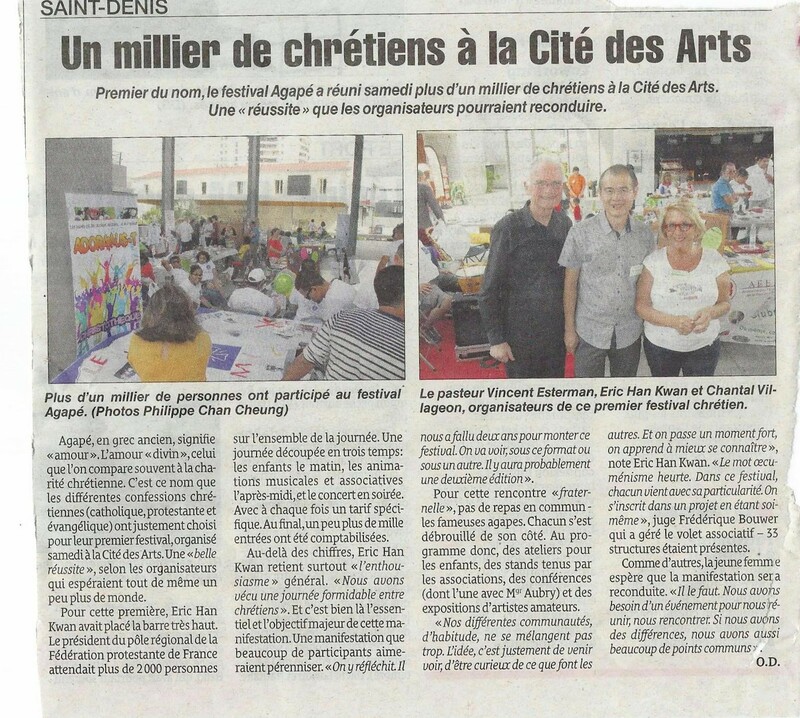 In June we helped plant a church in the capital, St Denis, in the north. This is a church of Christians from Madagascar and their meetings are in their native language. However we use their hall for an outreach meeting into the French-speaking community. This meeting has attracted people from the east of the island through our Facebook and website exposure. 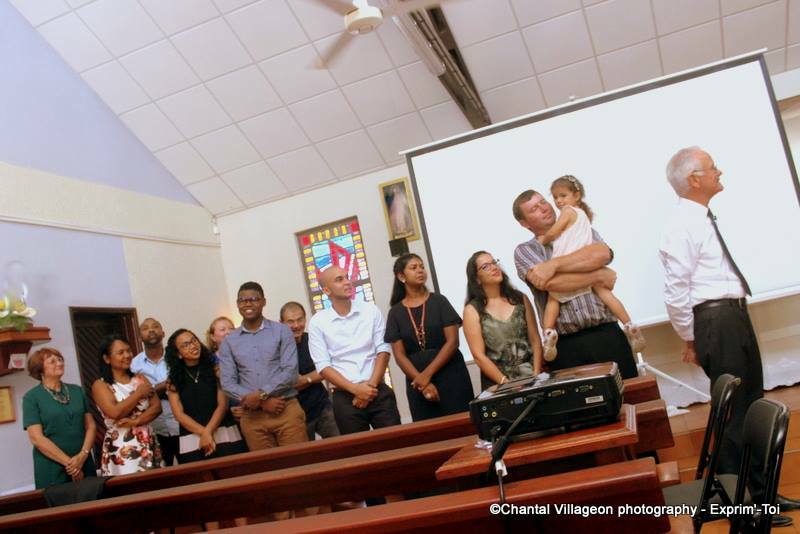 Last Saturday evening we launched our third church, this time in the east of the island with around 30 people in attendance (see photo below). There is real excitement around the place! It's just great seeing God move and being surprised by the next thing He does. I HOPE EVERY CHRISTIAN READING THIS EXPERIENCES THIS EXCITEMENT IN THE CHURCH HE IS ATTENDING! IT'S WHAT CHURCH SHOULD BE ABOUT. We launched A NEW CHURCH last night in the east of Reunion Island! Around 30 people were present and there was great enthusiasm and expectation for God will do here. 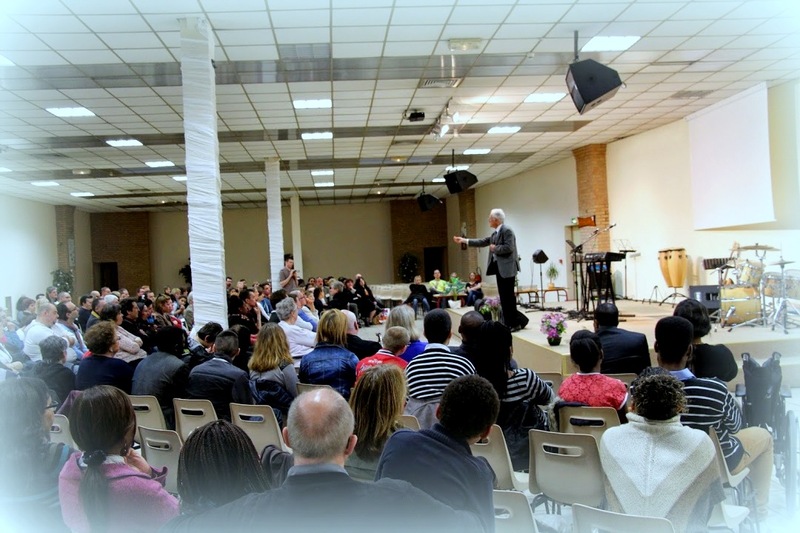 We now have our Sunday service in the West, a branch church in the North, in the capital St Denis, and a branch church in the East with a Thursday meeting in the South. GOD'S ON THE MOVE! MOMENTUM IS STARTING TO BUILD FOR THE 9 SEATER BUS APPEAL ! Just 4 days into the appeal we have received 8 gifts totalling $7,800. A fantastic start ! Our target is 15,000 euros or $25,000. We’re well on the way ! To those who have sent a gift, thank you for your generous support ! 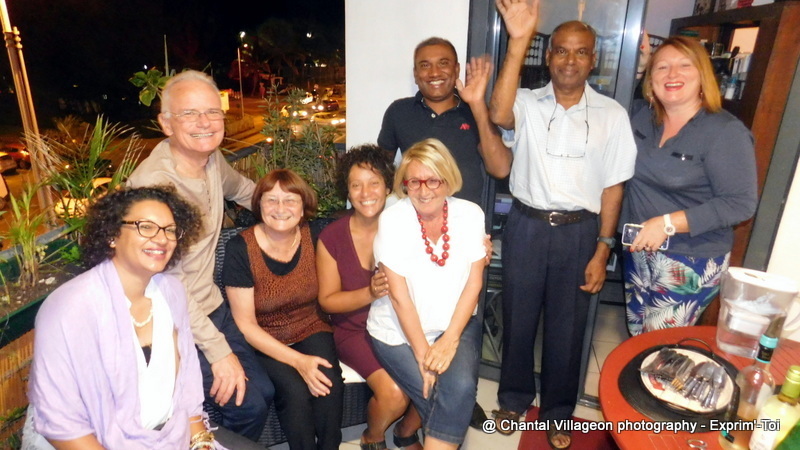 Perhaps you could consider making a contribution to this fund for the purchase of a bus which will be a great help in the pioneering work Denise and I are doing on Reunion Island. When there is a need, there is always in God’s economy, an answer to that need. Thank you so much for prayerfully considering this request.God bless,Vince and Denise. PS Regarding about the photo, the bus we will purchase will most probably NOT be a VW in the present climate ! FROM VINCE AND DENISE ESTERMAN ! Our work on Reunion Island is progressing. In recent months we have seen a number of new people attend our meetings and up to 10 people have given their lives to Christ. We now run meetings in the capital St Denis in the north of the island, and in St Pierre in the south, with our Sunday service in the west. 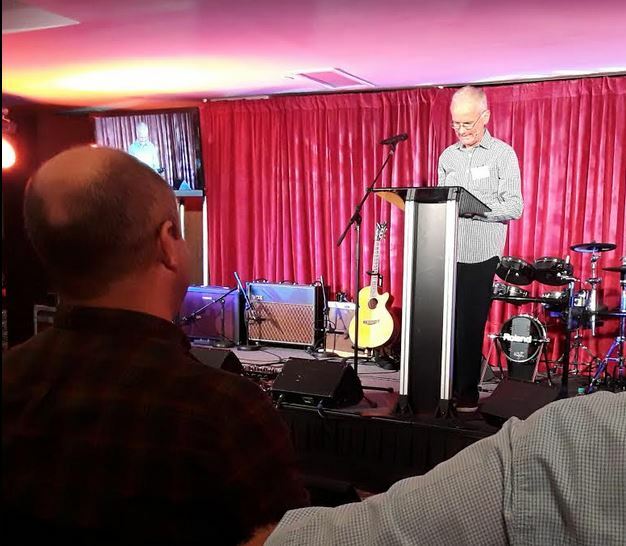 We are still in the early phases of this church plant and are confronted with a number of pressing needs none more than musicians and worship leaders. I still lead the worship with my guitar at the ripe old age of 61 ! Where are all the young musicians ?!! Another pressing need is TRANSPORT. Many people simply don’t drive or don’t have cars. Whole families can’t come to church for lack of transport and each Sunday we arrive to church with a boot load of equipment and a car load of people. So we are launching an appeal to raise sufficient funds for us to purchase a good quality vehicule. This is the first time we have made such an appeal in all these years of ministry, as far as we can remember. Thank you so much for your help with this special project. I CAUGHT THIS "FISH" on the seafront of St Pierre. 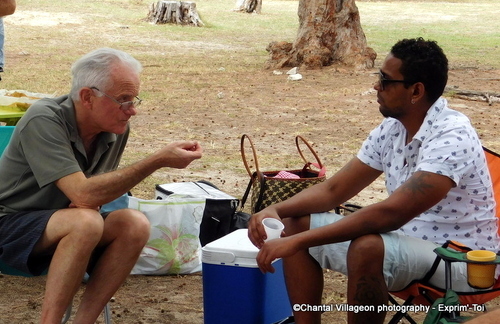 I was out with my sketchboard one Saturday afternoon 2 months ago when this man, Ramon, listened to me intently. He contacted me the following week and came to church with his 2 kids. He gave his life to Christ and since then keeps bringing new people, around 15 so far! A lady he brought yesterday gave her life to the Lord along with another lady. PRETTY EXCITING STUFF! HIS PHOTO WARMS AN OLD FELLAHS HEART! 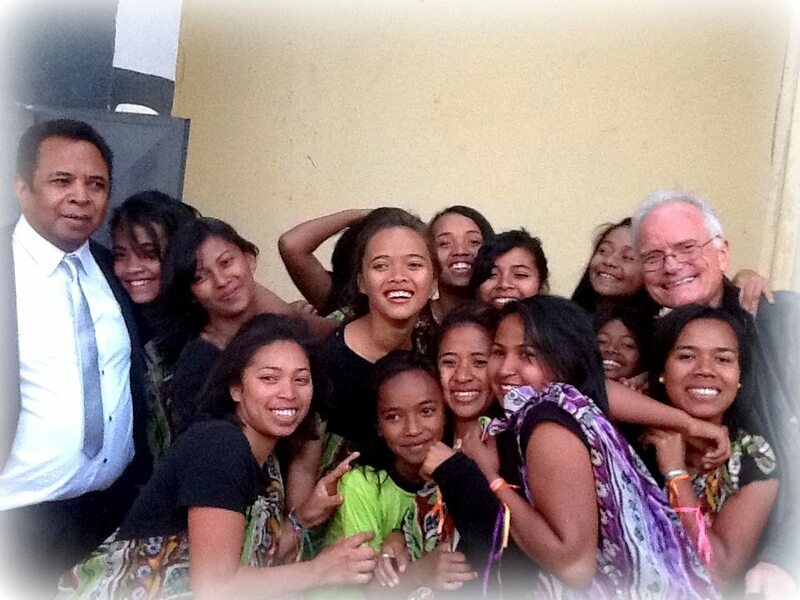 Here I am with the dance group of girls in a church in the town called Antsirabe in the heart of Madagascar. I was one of the speakers at a pastors conference bringing in pastors from all over the country. These girls are sensational! They danced so energetically, so skilfully with all the praise songs we sang. The joy had to be experienced to be believed. I've never been in an atmosphere of joyful praise as here. 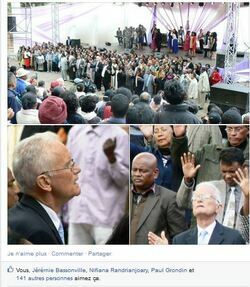 Madagascar is one of the poorest countries on earth yet the Christians show such abundance of spirit. There was a special connection all week with these lovely, lovely people. 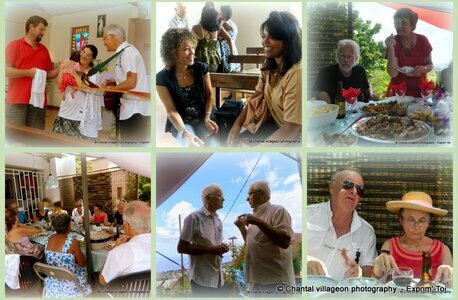 REUNION ISLAND - Here are a few shots of some of our folk yeasterday enjoying a meal together after church. 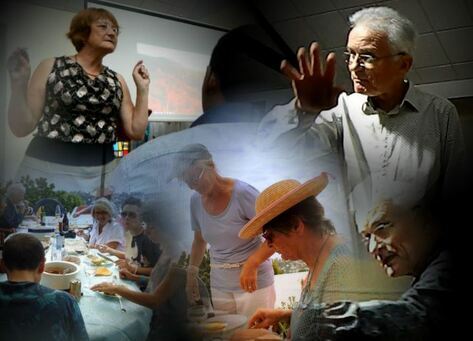 The centre photo on the left shows a man speaking with another man and a woman. The man speaking heard me telling stories with my sketchboard on the seafront two months ago. He came to church with his two kids, gave his life to Christ and now each Sunday brings new people along. It's the way it should be! It makes church an exciting place to be. It's been a long day! 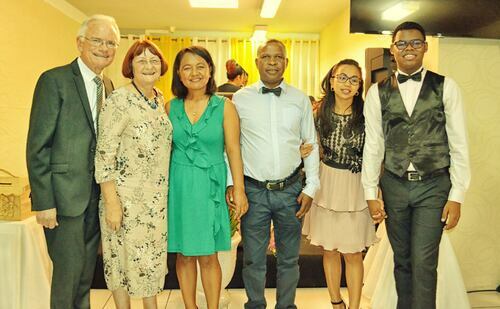 We've been helping to move a key couple in the church, Pierre and Monique, picture between Denise and me. 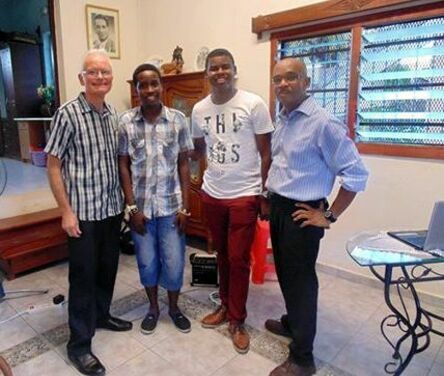 The two guys who helped us on the left of photo are guys who are coming to faith. Farid on the far left, is a builder and Nicolas is a dentist. We are enjoying a glass of Vouvray Methode Traditionnelle, otherwise known as champagne. They love the fact that our feet are firmly planted on the ground but our hearts are firmly attached to heaven. 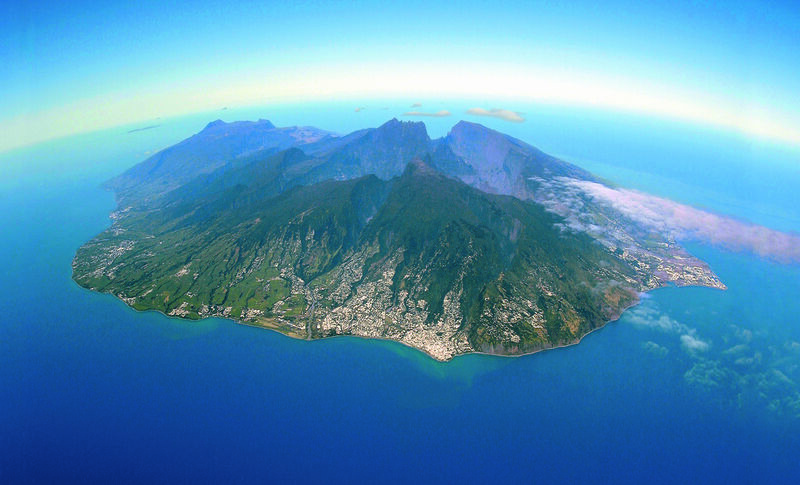 REUNION ISLAND - The world is talking about Reunion Island! 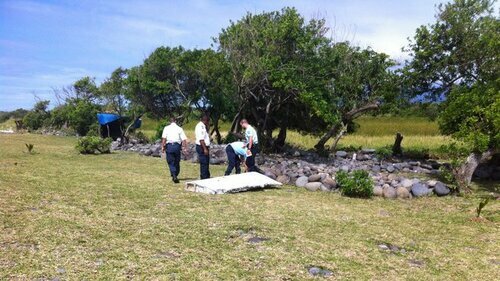 That's where the debris of the Malaysian Airlines MH370 has ended up. We have lived here since August 2012 planting a new church. We are now on the map! THIS IS REALLY WORTH A COMMENT for my English-speaking friends. 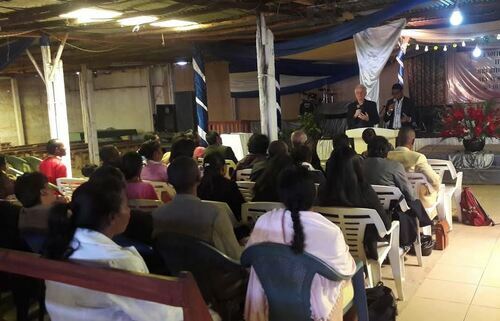 I'jve ust spent the last 4 days in the capital of Madagascar, Tananarive, speaking at a pastor's conference. I took a number of the morning sessions speaking to 1,200 people while my good friend, Pastor Jules, spoke in the afternoons in the evangelistic crusade with 7,000 people cramming the amphitheatre. Pastor Jules is an incredible man. 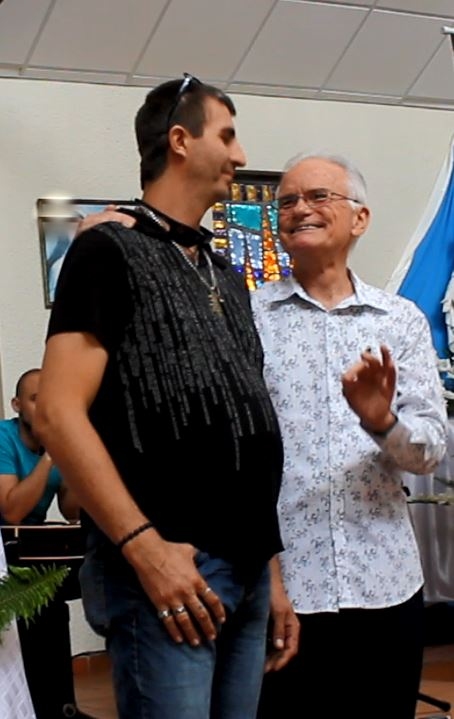 He brought revival to this island in the 1970's an counts 3000 churches through the country that see him as their spiritual father. It's estimated that there are 2 million people who have come to Christ through his ministry and who are now in churches in a country whose population is around Australia's, 22m. He spoke simply but powerfully and the crowds that came to hear him listened with enthusiasm and faith. The musical programme had to be experienced to believe. The song leaders led the thousands who all seemed to know the up-tempo songs with the corresponding actions. At one stage the inter action between people and song leaders shook the amphitheatre. From my front row position I just looked around and delighted in people who love God joyuously singing their faith. I will be coming here more often in the future. 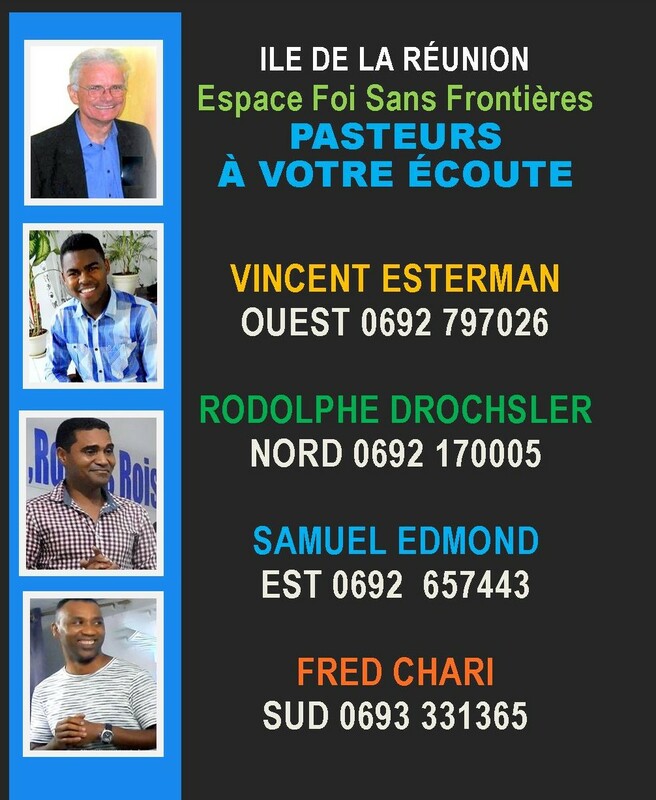 In fact in September Pastor Jules and I will be doing a tour of major cities in this very poor country taking the Gospel of the love of Jesus to the people.CE est vraiment vaut un commentaire pour mes amis anglophones. I'jve ust a passé les 4 derniers jours dans la capitale de Madagascar, Tananarive, prenant la parole lors d'une conférence de pasteurs. J'ai pris un certain nombre des séances du matin s'adressant à 1, 200 personnes tandis que mon bon ami, pasteur Jules, a parlé dans l'après-midi à la croisade d'évangélisation avec 7, 000 personnes, l'amphithéâtre de bourrage de crâne. 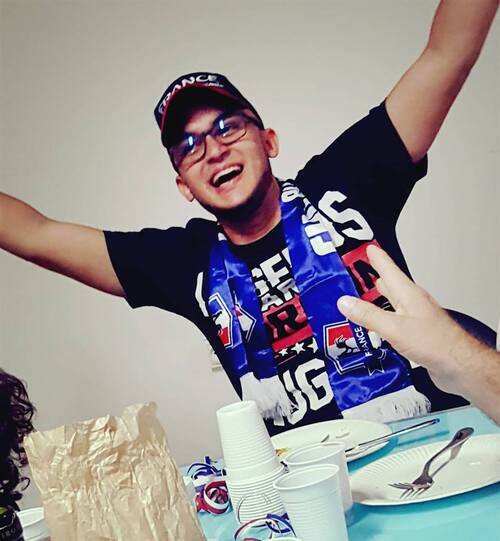 Pasteur Jules est un homme incroyable. Il a apporté à Renaissance à cette île dans les affilées une églises de 3000 chefs d'accusation à travers le pays qui le considèrent comme leur père spirituel. On estime qu'il y a 2 millions de personnes qui sont venus à Christ par l'intermédiaire de son ministère et qui sont maintenant dans les églises dans un pays dont la population est autour de l'Australie, 22 m. Il parlait simplement mais puissamment et les foules qui sont venus pour l'entendre écoutaient avec enthousiasme et la foi. Le programme musical devait être expérimentée de croire. Les dirigeants de la chanson a conduit des milliers qui tout semblaient connaître les chansons up-tempo avec les actions correspondantes. À ce stade l'action inter entre les gens et la chanson dirigeants ont ébranlé l'amphithéâtre. 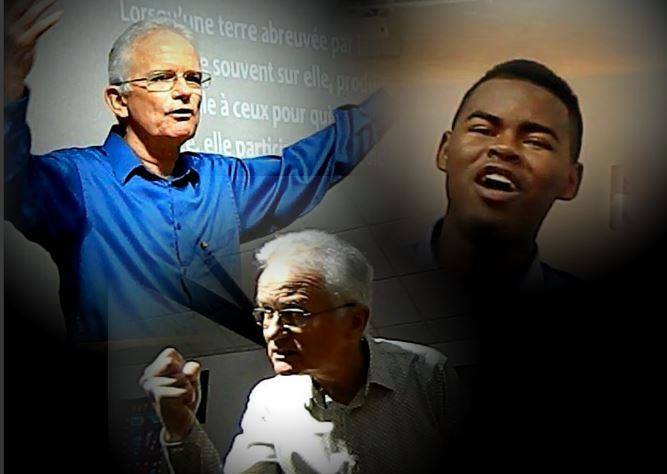 De mon poste de premier rang j'ai juste regardé autour et plaisir à ceux qui aiment Dieu joyuously chanter leur foi. J'ai sera à venir ici plus souvent dans l'avenir. En effet en septembre pasteur Jules et je vais faire une tournée des principales villes dans ce pays très pauvre, amener l'Evangile de l'amour de Jésus aux gens. THIS IS SUCH A GREAT PHOTO taken Sunday morning. I'm with my longtime friend Antoine Nocek. We have been working together for 28 years. In fact with our wives we started the movement of churches which today has churches all over France and in other French-speaking countries. A few weeks ago he suffered a heart attack. His arteries were blocked up to 90%. He could have died twice because of complications. We hung in with prayer that God would pull him through. And He did.! I was in Paris attending an annual conférence of our movement of churches and I had a window of opportunity to drive to his city to see him. We had a memorable evening together. He is weak but so bouyant, so full of faith for the future. I love this man. He is Polish and I am Australian. You couldn't find two more different personalities but we see God's work in the same way and we have travelled many years together pushing the frontiers of the Kingdom of God ever further. I thank God that he is still alive. He will make a full recovery and we will continue to fight the fight of faith. 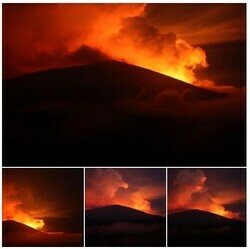 REUNION ISLAND - Our volcano has started erupting again - 2nd time this year! Spectacular images of the lava flow! THIS IS SUCH A GREAT PHOTO! The lady on the left is Marie Andree and with her husband she has been part of our church on Reunion Island nearly from the beginning. She has been sharing her faith with her secretary at the hospital where she works. 3 weeks ago Aurélie, the secretary, came to church with her husband and two small children. At the end of the service she have her life to Christ. She has such a glow about her and yesterday the whole family was back in church and stayed on for the picnic. THIS IS WHAT IT'S ALL ABOUT! I've seen this happening for 40 years but each time it's like my first experience of seeing God's grace in someone's life. Thank you Jesus for loving us! 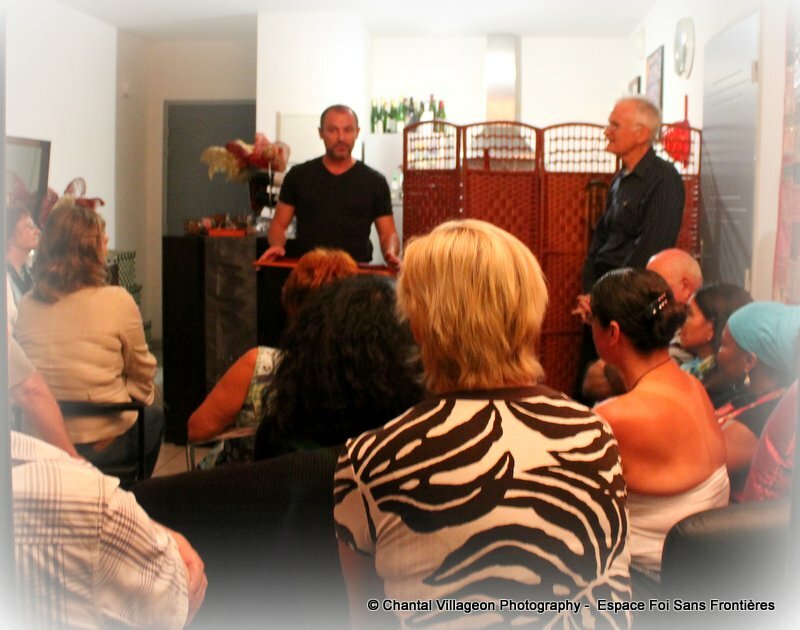 This is also a major event in the work we are doing on Reunion Island. Dave and Laurence Hernandez and their two boys, Damien and Breandan, are joining us on the island to minister along side of us. 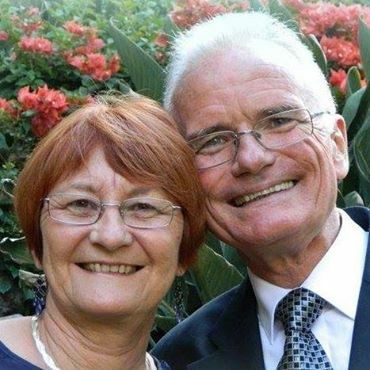 Dave was for a number of years associate pastor of Life Ministry Centre in Melbourne, Australia. 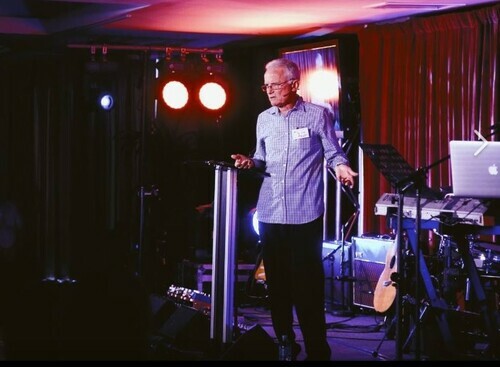 They then took up the position of senior pastor at a church in Healesville, Victoria. They have a very similar mix to Denise and me. They are both French Aussies and speak French fluently. 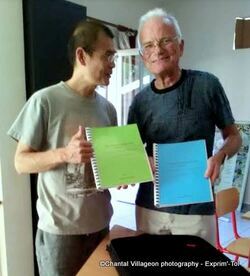 They come to Reunion with French passports so they are at home here. Dave has a teaching/pastoral ministry and has a burden to train Christians to become disciples of Jesus. That will blend beautifully with our strengths. It's one of a number of huge developments we are experiencing at the moment. So what's God preparing around the next corner...? 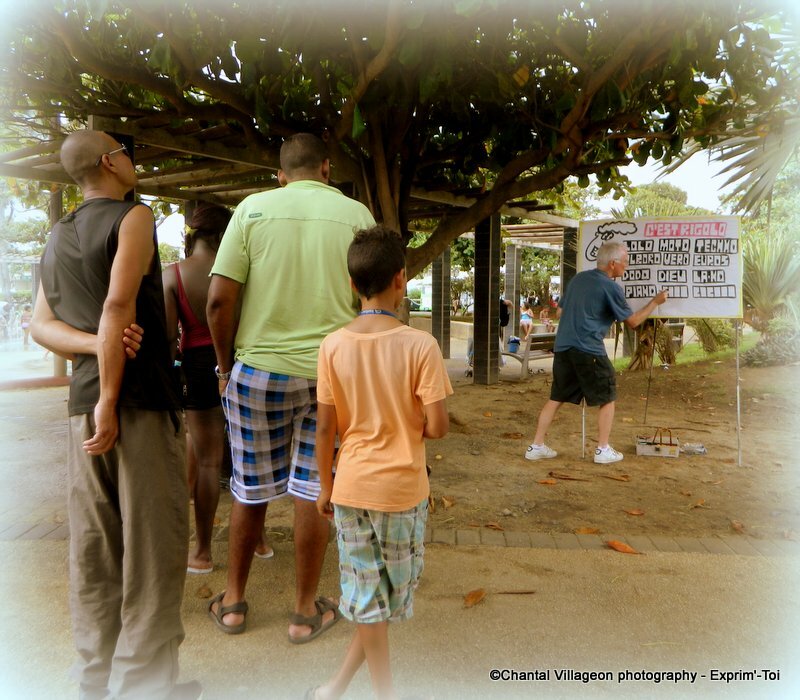 I was back out on the streets this afternoon with my sketchboard on the beach front of Saint Pierre, Reunion Island. There were so many people listening to me - children , young people, parents, retirees. It's good to know that after so many years in ministry we are still very relevant. Next year I will be clocking up 30 years of sketchboard work reaching the masses. 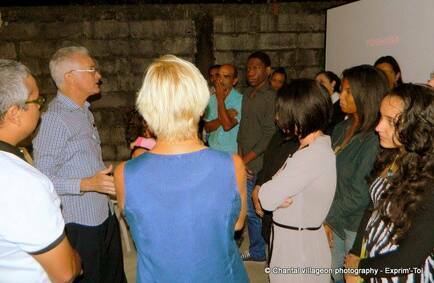 This was our first home meeting last night in a remote village in the south of Reunion Island. Most of the people have come to know Jesus with us. We have followed them up over the last 2 years and we are so thrilled to see the fruit of our work. It was a very joyful evening! 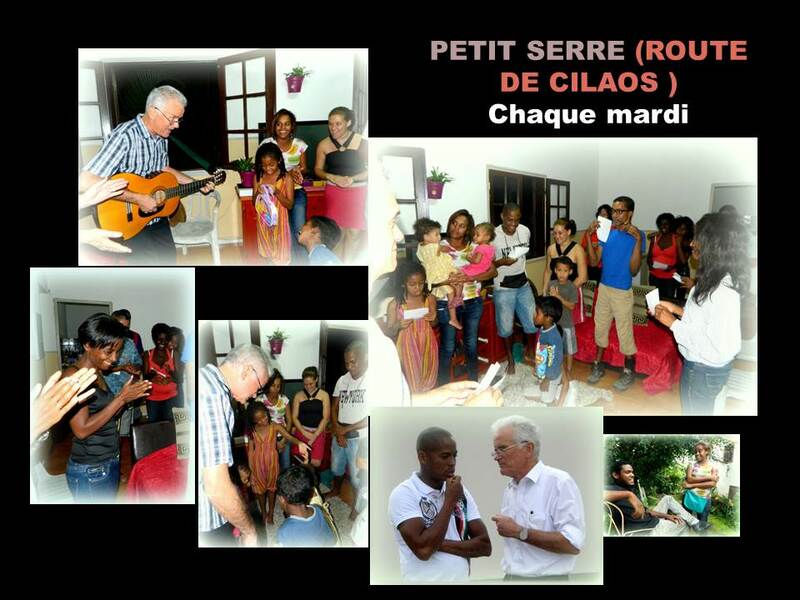 More photos from last night's home meeting in the village called "Petit Serré"